Site assessment for Kayenta Health Care Center Housing Complex. Re-leveled 10 trailers units being used as staff quarters. Scope of work included: site assessment, concrete pad fabrication (206 pads in total), importing pads, setting pads, re-leveling 10 homes, re-connecting dryer vents and plumbing supply lines and sewer lines under each home as needed. Work also included installing skirting vents as well at each trailer location to help with venting. ZCI furnished door locks, dead bolts, panel doors, bits, casings for the Red Valley School Facility Maintenance Department for internal use. Provided door related materials for Bureau of Indian Affairs School. Field assessments for woodstove and weatherization for 85 participants for Shiprock Agency. Includes for Burnham, Upper Fruitland, Nenahnezad, San Juan, Hogback, Shiprock Chapters. Includes field assessments, inspections and project management for weatherization recommendations, CAZ and Blower Door Testing for 84 residences at the above-mentioned chapter boundaries on the Navajo reservation. Includes pilot air kits installation for 10 residences in the Shiprock Area. ZCI provided 4,376 tons of processed base course to Navajo Department of Transportation for Little Water Road Construction. Includes materials and truck delivery. Engineering study to Evaluate two parking lot areas to survey rehabilitation and reconstruction conditions based on findings for Bu. Scope of Work included: visual survey, exploratory drilling, laboratory analysis (soils testing), engineering analysis and reporting. Includes Borings, geotechnical profile, recommendations for site treatments, including safety and traffic control plan. Total area of work is 112,700 square feet. Drywall repairs to foyer entries at 4 apartment units. Drywall repairs included removing old damaged insulation and damaged drywall at ceiling locations including, some minor wall damage. Included door adjustments to main exterior doors at three units. Included drywall hanging, mud, tape, sanding and texture to match existing finish. Included Daily jobsite clean up. ZCI provided 100 steel metal doors (18 ga) with 4” metal door frames, 100 hollow core door and 624 count of door hardware for the United States Dept of Energy for the NNSA DOE in ABQ, NM. Field assessments for woodstove and weatherization for 85 participants for Shiprock Agency. Includes for Burnham, Upper Fruitland, Nenahnezad, San Juan, Hogback, Shiprock Chapters. Includes field assessments, inspections and project management for weatherization recommendations, CAZ and Blower Door Testing for 84 residences at the above-mentioned chapter boundaries on the Navajo reservation. Includes pilot air kits installation for 7 residences in the Shiprock Area. 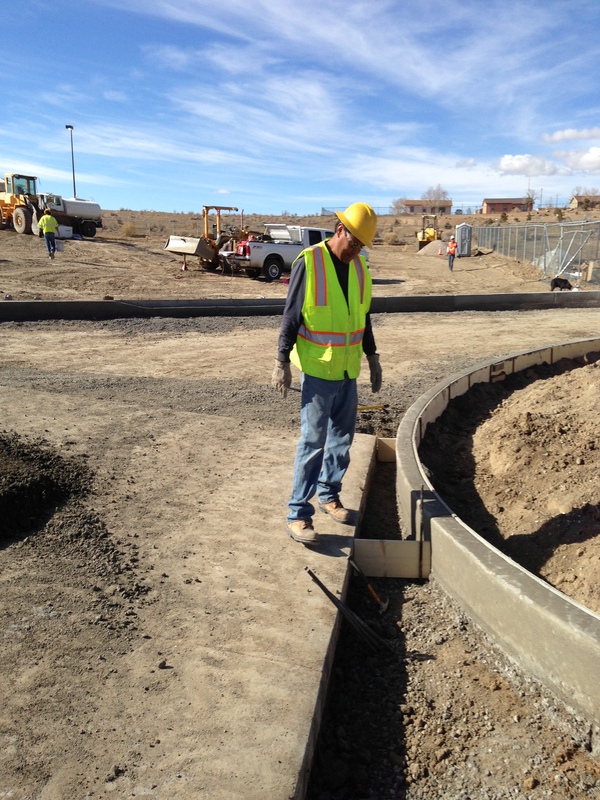 Furnish labor & materials to install 25’ x 35’ @ 4” thick concrete slab at NAPI Region One. Includes mobilization, ground grading, excess dirt to be removed, compacted, forming materials, forming labor, form oil, no reinforcements and concrete mix. Included finishers and labor to strip forms and concrete saw cuts for control joints. Daily jobsite cleanup, skid steer, & plate included to complete job. ZCI furnished 1A and 1AA fiberglass ladders (OSHA grade) to Facility Maintenance Department for the Tiss Nazbus Community School. 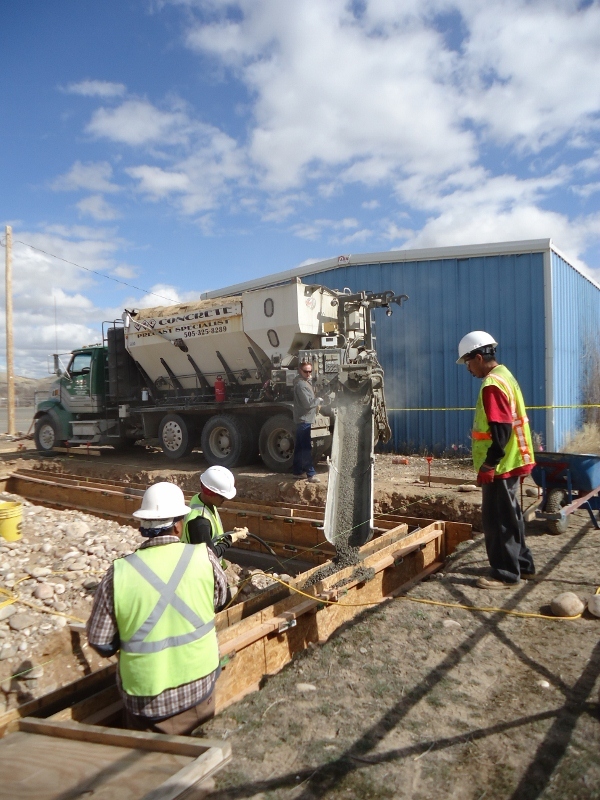 ZCI provided 4,361 tons of processed base course to Navajo Department of Transportation for Little Water Road Construction. Includes materials and truck delivery. Field assessments for Woodstove and Weatherization Participants for Shiprock Agency. Includes for Burnham and Sanotee Chapters. Includes Construction and Project Management and Blower Door Testing. Acoustical ceiling installation in Capitol Building Conference Room. Installed carpet squares and cove base at floor location and weatherized all exterior doors leading into the conference room. These upgrades also sound proof the conference room from outside noise. ZCI furnished plumbing supplies to Shiprock Rock BIA Community School Facility Maintenance Department. Field assessments for 28 Weatherization Participants for Shiprock Agency. Includes Admin and Non-Admin Time. Field assessments for 28 Stove 1 Participants for Shiprock Agency. Includes Admin and Non-Admin Time. ZCI furnished conditioning unit and refrigerant materials requested by BIA Shiprock Community School. ZCI provided 4,376.68 tons of processed base course to Navajo Department of Transportation for Little Water Road Construction. ZCI responsible for stripping down all roof materials down to roof deck, including some damage deck replacement, cricket fabrication, and removal of all caulking around RTUs and penetrations. 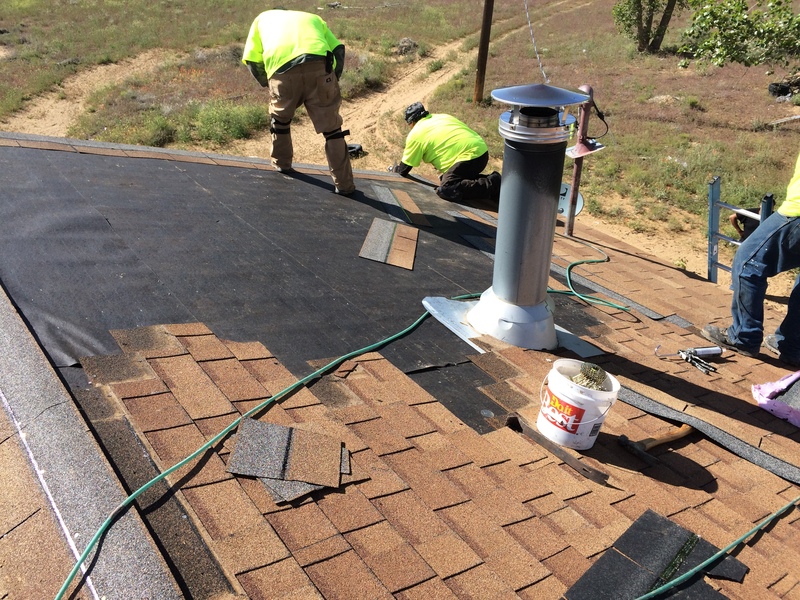 ZCI installed ice and shield and used torch down methods at valleys prior to Tamco shingles being installed. Installed rubber boots at roof top penetrations and sealed off all RTUs and skylights. Flashing and metal caps were also installed at perimeter of roof. Replace two porch areas attached to the octogen roof profile. A total roofing area was approximately 4,100 sq.ft. ZCI recycled all old metal and all debris was taken to a qualified landfill. Hydro Excavation work for employee restrooms and line connections. 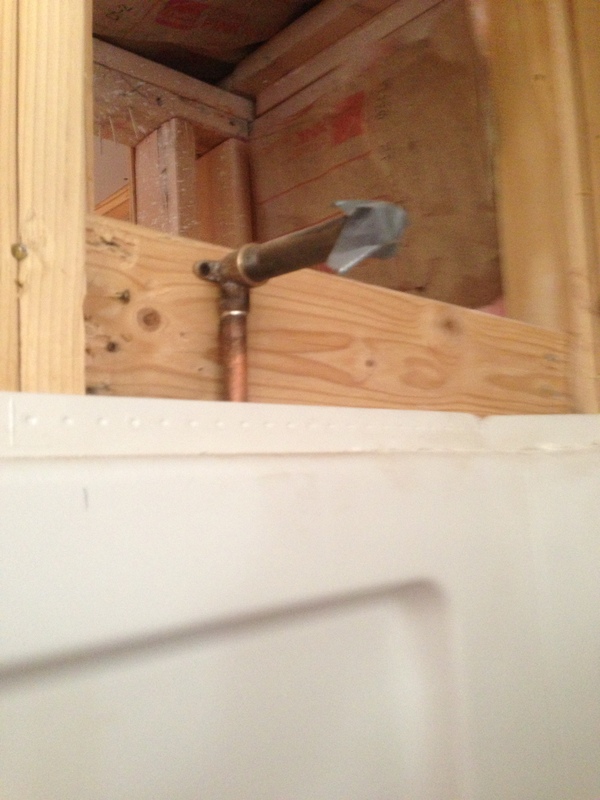 Install water line and shut off valve to restrooms. Waterline was wrapped with insulation. ZCI had to hydro excavate (subcontracted out) and backfill trench. ZCI complied with waterline permitting and LOTO. The waterline and water pressure was tested and passed. ZCI provided 4,361.18 tons of processed base course to Navajo Department of Transportation for Little Water Road Construction. Supplied materials – Louver Windows (2 each) with bird screen and framework. Additional steel framing was completed for window location at Building 19 Warehouse (West North Location). Provided labor, materials, equipment, delivery, and supervision for trailer skirting, installation of rigid insulation, skirt vents and prime and paint of skirting. ZCI also installed stairs and concrete pads for three cedar decks. ZCI furnished construction supplies requested by BIA for Shiprock Community School Maintenance Department. Supplied: wheel mounting kits & engine drive pump kit. Installation of client provided paper towel dispensers at Four Winds Lodge and Golden Eagle Lodge and installation of composite benches at four locations in Four Winds Lodge. ZCI furnished Johnston supplies list requested by BIA Shiprock Community School for: Actuators, valves body, pleated filters. Supplied Sherwin Williams paint and priming materials list requested by BIA Shiprock Facility Maintenance Department. ZCI provided labor, materials, equipment, transportation and delivery, supervision and administrative support to complete installation of VCT tile in the Maintenance Area and the General Service Hallways. 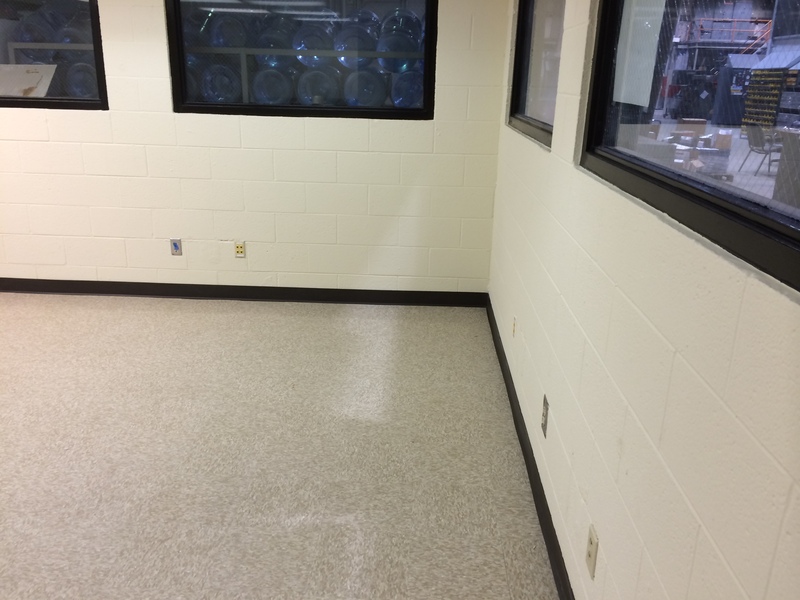 Vinyl Sheeting was installed in the Labs and the X-Ray Waiting area. All flooring was demolished, knocked down floor glue and loose concrete, floor prep (floor leveler), fine scaping, glue trowel on, floor materials installed, cove base installation and welded seams completed all by ZCI team. Clinic remained in operation while work was done afterhours. Implemented weatherization upgrades for 17 homes based off of Pre-Test results. Also completed 17 Post Test after weatherization installations. This is for Shiprock Pilot Participants. 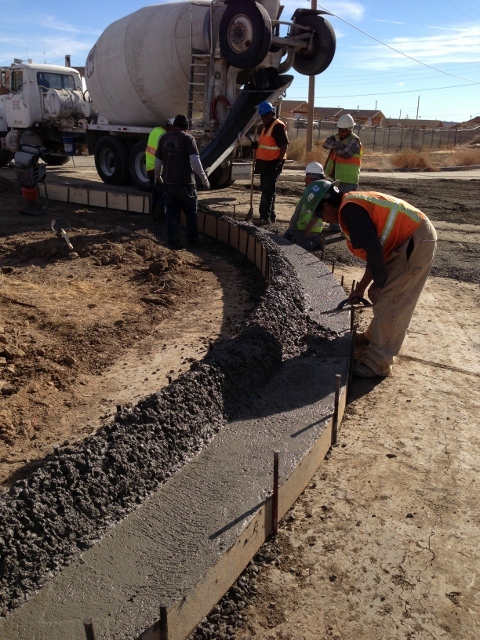 ZCI provided 123.57 tons of base course to Navajo Department of Transportation for Little Water Road Construction. Conference meetings to Closeout Stove Pilot Installs only. CAZ readings for stoves and appliances-based off of CAZ testing. CM and began Stove Pilot Closeout. Conference meetings for Weatherization Testing implementation in the field for Shiprock Agency, documentation photos, field results for Weatherization and CAZ testing, collected field information and field photos and forwarded to Pinnacle. Conference for Pre-Testing. purchased consumables for recommended weatherization upgrades for Pilot Recipients. Report for revised weatherization’s, reported fail CAZ tests and made recommendations for some appliance purchases. Discussions on project approach results and wrote scope of work for Pilot Participants. SOW was based on: Blower Door testing results, CAZ testing results, Flan Flow Testing results, Gas Line Testing results, Co testing results and failed tests. Includes Port to Port Travel time and Travel Expenses Reimbursement. Supplied window glass for Cafeteria and Dormitory. ZCI provided drywall repairs, two coat primer and one coat of paint at the janitor’s closet in the Administration Building. Conference meetings for Weatherization and Purchase of Testing Equipment. Schedule site visits with 18 pilot homes to conduct testing to make recommendations for weatherization. Project approach for weatherization testing and meeting arrangements confirmed for the month of June. Supplied materials – Louver Windows (2 ea.) with bird screen and framework. Windows for Building 19 Warehouse (South East Location). Labor for industrial size louver windows with bird screen to for Building 19 Warehouse (South East Location). 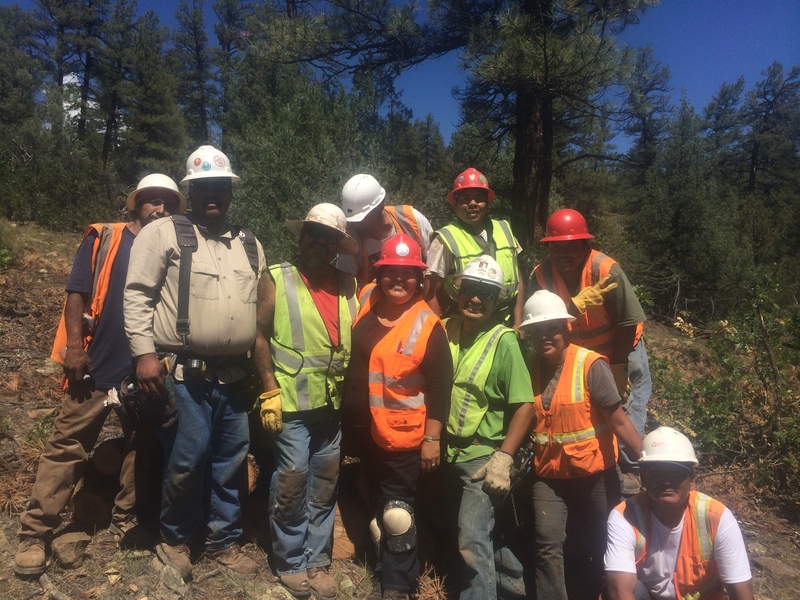 ZCI provided all labor, materials, equipment, supervision and transportation of 18 fire pits to the Grand Canyon North Rim. ZCI did all the forming, rebar installation and concrete pour and finish to complete 18 fire pit bases. All concrete work performed off site and hauled in with fire rings attached at the park. ZCI also demolished all old fire pits and haul to waste site in Utah and recycled old fire pits. Conference meetings for Weatherization and Training Pilot Project in Santa Fe. Began discussion for Weatherization Training implementation for field work on the Pilot participants. Discussed project approach for Pilot Participants: Blower Door testing, CAZ testing, Flan Flow Testing, Gas Line Testing, and Co testing. Includes Port to Port Travel time and Travel Expenses Reimbursement. Testing Plans for this month. Conference meetings to Closeout Pilot Installs. Report writing for project close out and project clarifications. Project Management Stove Pilot Closeout for this month. 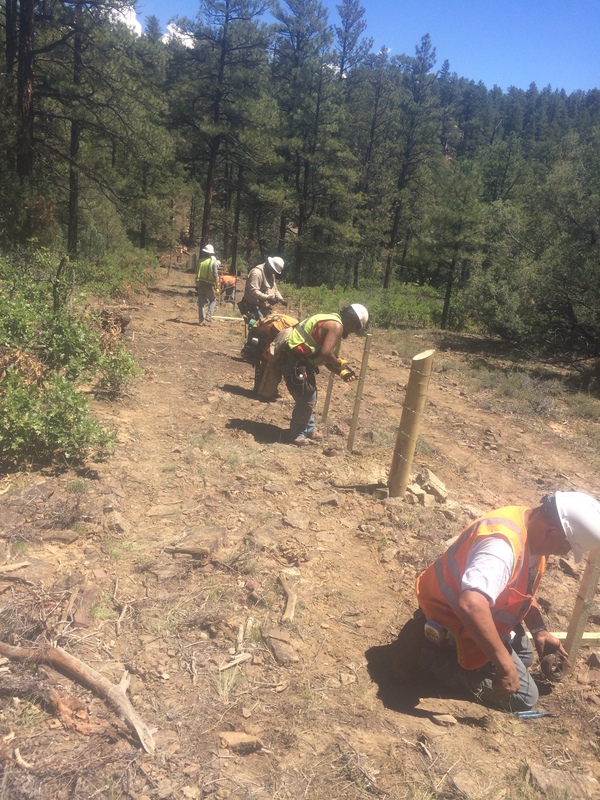 ZCI provided all labor, materials, equipment, supervision and transportation to renovate two historical buildings at Bandelier National Park. 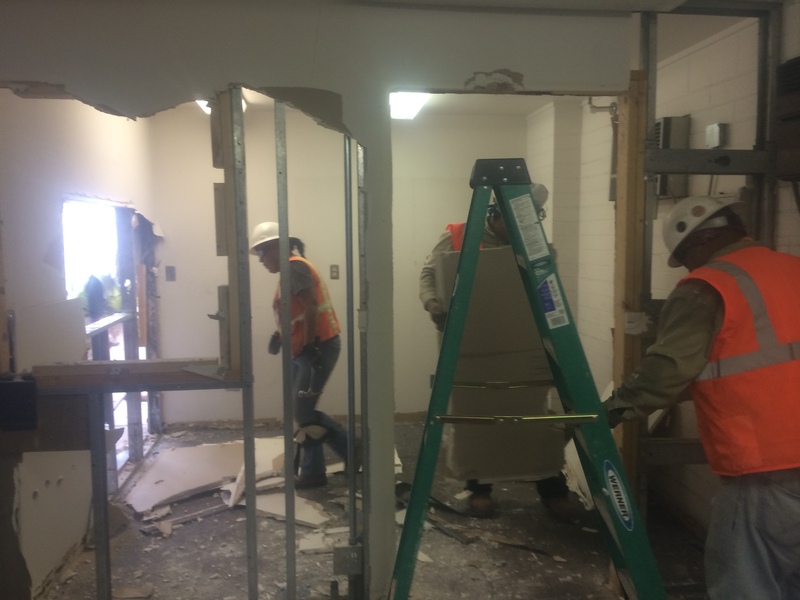 Renovation work applied to Building #HB-17 (Kitchen and Cafeteria) and to Building #HB-15. ZCI performed all demo work, framing, drywall installation, drywall tape and finish, priming, and painting at both locations. Includes subfloor repair in utility closet, VCT in stallion at utility closet along with cove base, Install of base cabinets and T & G counter tops (historical match), Staining of cabinets and trim work, fabricate a wooden product display shelf , restore historical doors at both buildings, installed new solid core doors at HB-15, floor staining in HB-17 and Sealing the floor at HB-17. Electrical installs at both buildings, install new light fixtures and wall receptacles and all applicable electrical conduit, accessories etc. There was an electrical panel upgrade at HB – 15. Installed a water fountain at HB-15, T & G ceiling repairs at both buildings, installed iron railings at HB-17 and repainted window pane and window sills as well at both historical buildings. Included jobsite cleanup, materials recycle were applicable and disposal of waste to offsite landfill. ZCI provided 200 doors and associated hardware -heavy door closures for the United States Dept of Energy for the ABQ Office. Completed May 2018 Pinnacle West Capitol – Weatherization Project - May 2018	Shiprock, NM Conference meetings for Weatherization’s for Pilot Project for Shiprock Crew Weatherization Training for one week at SFCC. Blower Door, CAZ testing, Flan Flow Testing, Gas Line Testing, and Co testing. Includes Port to Port Travel time and Travel Expenses Reimbursement. Weatherization Training this month. ZCI removed and replaced master bath room Shower/tub. This includes leaking water line repair, minor interior framing, minor drywall and closet shelf carpentry work. Installed tub and new bath and shower fixtures. 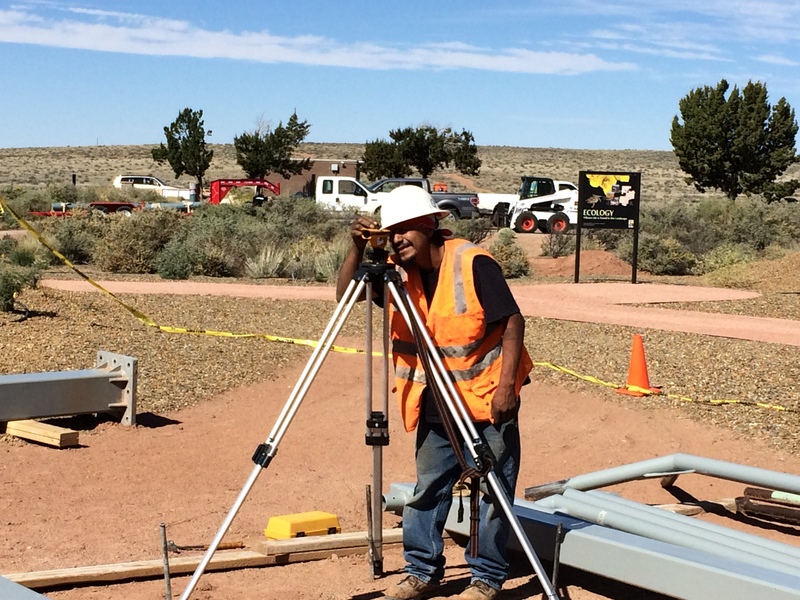 Project Management and Field Installations for Woodstove Pilot Project for Shiprock Agency Residents. Document Photos, field investigations for remaining 10 residents, Order Brochures & Pamphlets for Project, Quotes for Materials for Project, CO Testing, receive shipments, Begin Installations in the field for 20 residents that were selected for Pilot Stove projects EPA updates, SCE and Pinnacle updates. Materials and equipment purchases, Take after pictures for documentation and all disposal to Waste Management at offsite Landfill and recycle all metal removed from project. Project Management for April. 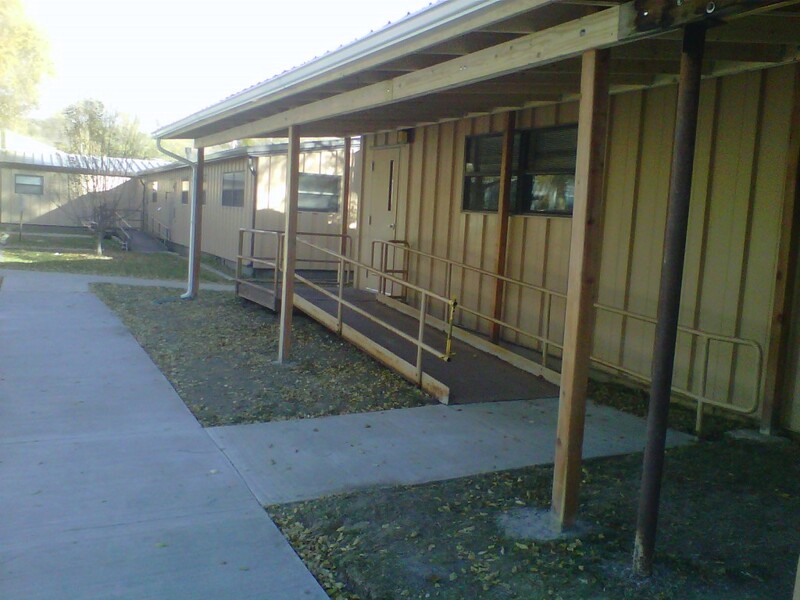 ZCI provided plumbing supplies for BIA Shiprock Community School Facility Maintenance Department. Furnished labor, supervision, tools and equipment to install client (NHA Housing) provided Duravent Kits Chimney Kits. Roof repairs on pumping plant roof (6,225 sq ft) to standing seam metal roof and sealed off 12 roof penetrations (RTUs) at roof line location. ZCI also ran 4 hour water test after job completed to ensure proper water tight repairs. Conference meetings for Woodstove Pilot Approach for Shiprock Agency Residents. Document Photos, field investigations for 20 residents, Order Brochures, Pamphlets for Project, Quotes for Materials for Project, CO Testing, receive shipments, Begin Installations in the field for 20 residents that were selected for Pilot Stove projects. Take after pictures and all disposal to Waste Management at offsite Landfill. Project Management for this month. Conference meetings for Woodstove Pilot Approach for Shiprock Agency Residents. 20 residents selected for Pilot Home Assessments and questionnaires completed and consent forms. Project Management for this month. 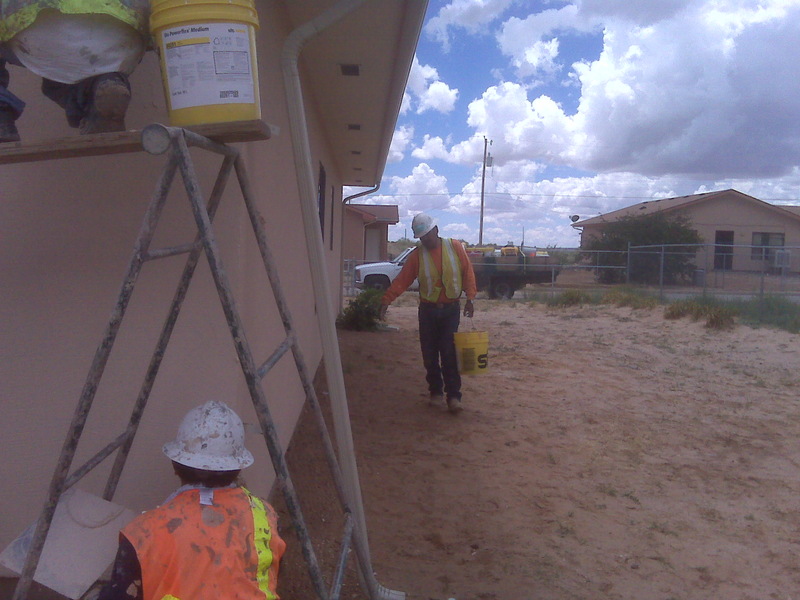 ZCI provided Johnstone supplies for BIA Shiprock Community School Facility Maintenance Department. Conference meetings for Woodstove Pilot Approach for Shiprock Agency Residents. Pulled all applicable permits and applications to remove old septic system and install a new septic system in compliance to national and state code and NTUA standards. Installed water line connection, septic tank, and leach field. Included all applicable accessories: water meter, angle stop, concrete collars, testing & inspections. Excavation & back bill was also performed by ZCI Crew. Supplied and delivered a playground set “Play Fundamentals” to Nenahnezad Chapter on behalf of the Veterans Park. Playground was for Pre-K to Elementary ages. Supplied batteries for BIA School Maintenance Office. ZCI provided 2” sewer line inspection with a 2” camera. ZCI performed the erection and testing of piping systems and mechanical equipment. Arranged for and furnished inspections, stampings, data reports, and certificates as required by the codes and standards. ZCI leveled, aligned, balanced, and adjusted all piping and equipment installed according to the drawings and/or manufacturer’s recommendations prior to release to APS. ZCI provided all necessary labor and materials to install 27 lf sewer drain pipe at the west side of the Admin Building next to employee break room. ZCI repaired damaged drain at the APS Administration Building. The job entailed landscape removal and replacement, hydro excavation, for the full length of 27 – 30 lf, and any and all chain link fencing work around. ZCI replaced damaged drain pipe, hauled off excess debris, shrub and fill. Imported skid steer for back fill and compacted fill and reinstalled rockscape, including job site clean up. ZCI provided a complete materials list with bid submittal to upgrade the existing south intercept (SIT) seepage collection system at the APS Four Corners Power Plant. ZCI Removed and replaced approximately 76 – 100 ceiling tiles and cut according to existing grid at the APS Admin Building. 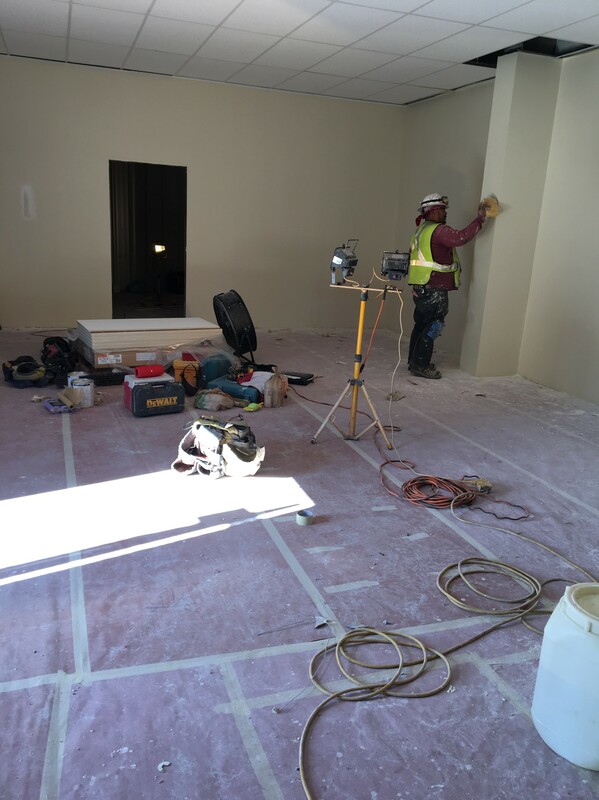 ZCI provided labor and materials and addressed the mold damage and acoustical ceiling tile damage at the APS Administration basement (Bisti Conference Room, and Gabe Yazzie’s Office). ZCI re-cleaned affected areas and applied 64 sq ft of Anti Mold Primer or Antimicrobial and Anti Mold Interior Paint at mold location. Then replaced 76 ceiling tiles. ZCI provided all necessary labor and materials to install approximately 6-9 sq ft of VCT floor tile at the 4/5 Unit Control Room. ZCI demolished concrete sidewalk slab located next to Building #641. Installed new slab and tied into foundation slab of school. Reinforced with #4 grade 60 bar at each end with connection to existing foundation and existing sidewalk slab. ZCI Repaired residential unit. 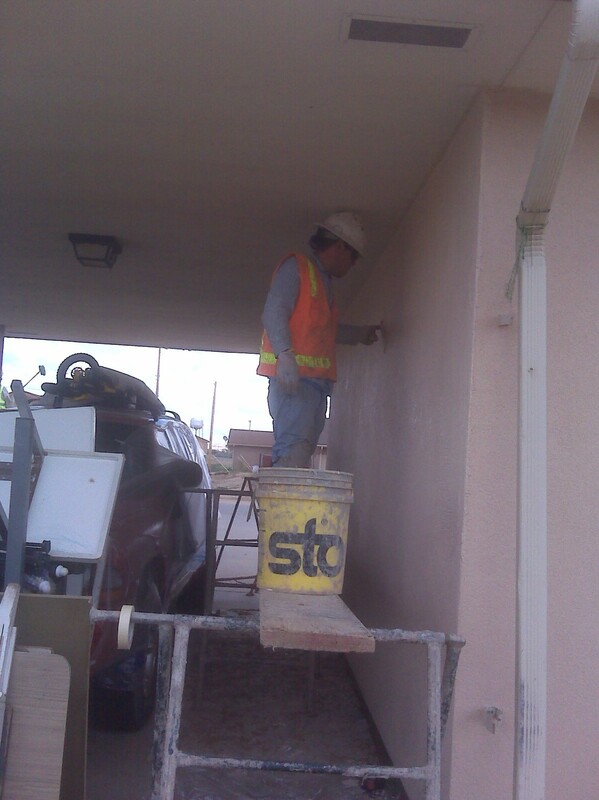 Provided all paint, labor, tools, equipment, transportation and materials to remove and replace exterior stucco. Repaint to match new stucco. ZCI repaired residential unit which included drywall repairs and painting, removal and replacement of damaged glass on double pane windows in living room and master bedroom, cabinetry repairs in kitchen, removed and replaced hallway closet door, removed and replaced 2 smoke detectors hallway and living room, repaired damage to corner bead at end of hallway to living room. Removed and replaced chrome bathroom towel rack and recessing white bathroom medicine cabinet with mirror door. Painted over all graffiti and exterior south entrance door. Removed and replaced motion sensing porch light with bulbs and mounting assembly. ZCI installed and finished several highly durable and attractive solid colored broom finished concrete slabs in different requested locations in the Great Sand Dunes National Park and Preserve. ZCI repaired storage room after fire damage. Furnished all paint, labor, tools, equipment, transportation, and materials to make all necessary repairs. Remove and replace storage door, frame and hardware. Remove and replace frame wall studs, exterior corner studs, bottom sole plate and top plates 2 X 4 double header(door), wall sheeting. Reinsulate walls with fiberglass insulation. Remove and replace drywall, hung, tape and textured. Repaired and replaced all fire damaged electrical wiring, boxes, switches and light fixtures. ZCI supplied all labor, materials, and tools to install a new Portland based finish on the entire exterior of a roughly 1900 sq ft house which is staff housing at Great Sand Dunes National Park & Preserve. ZCI provided removal and replacement T1-11 at location of Main Building. Replaced any damaged insulation. Installed vapor barriers and angle brackets at corners of building and trim at corners. Properly caulked windows and doors, and installed trim as well. Reinstalled gutters and exterior cabling at completion. ZCI installed shelves and countertops for new desks. Included prime and paint to exterior office wall. Commercial renovation work. ZCI constructed additional 2nd floor turbine room. 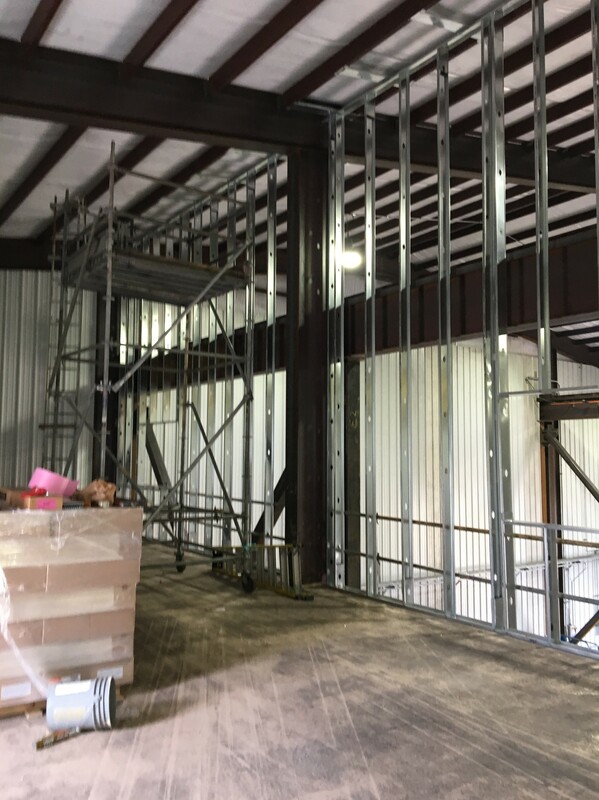 To include metal framing, ceiling grid installation, insulation, windows, doors, wallboard, drywall finishing and painting, insulation and pro-panel at exterior walls. ZCI provided electrical construction materials. ZCI supplied and installed mini blinds for one window for office in Bldg. 661. 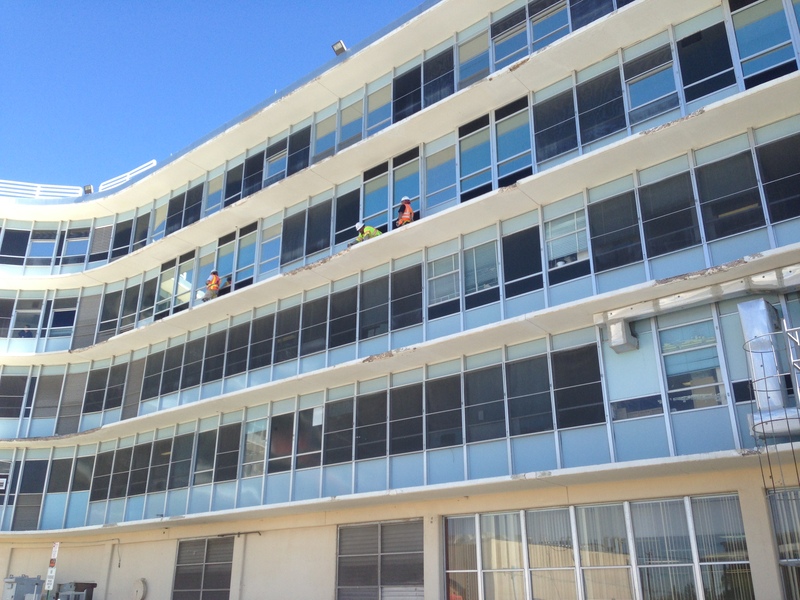 ZCI supplied and installed mini blinds for six windows at Facility Maintenance Bldg #645. ZCI furnished and installed new blinds to replace worn and damaged window blinds for the dining and kitchen areas at the Aneth Community School. ZCI furnished and installed new blinds to replace worn and damaged window blinds for the Living area, Sleeping area and bathrooms at the Aneth Community School. ZCI furnished all labor, materials, tools, equipment and transportation to install 783 LN FT of chain-link fence and posts in compliance with current fencing code requirements. Removed and disposed of shrubs, weeds, objects along the path of fence and existing fence along boundary line. ZCI renovated main turbine deck for 8 man crew. Completed drywall repairs, primed and painted office, installed office cabinets (uppers and lowers beneath desks) and installed desk tops. Completed a small break station, one window repair. Installed 8 filing cabinets and special ordered dry erase board. 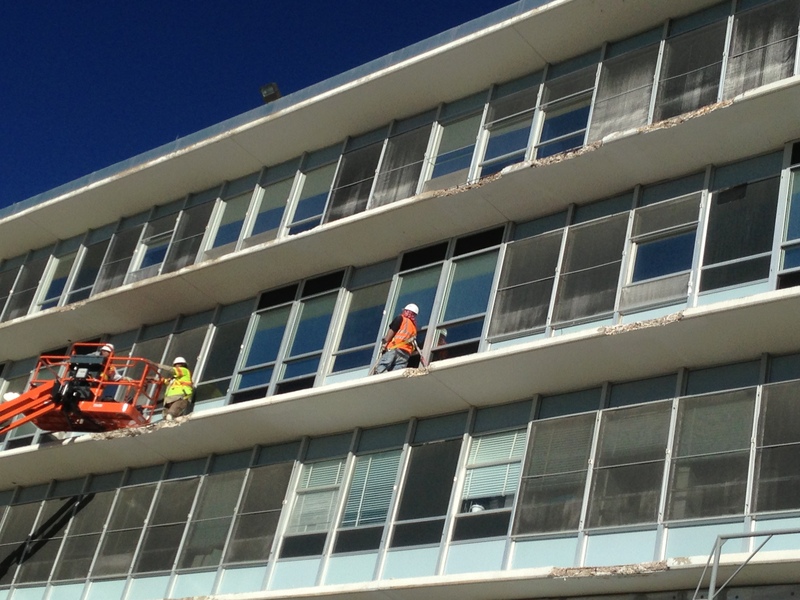 ZCI Removed and replaced one tempered window glass 29-5/8” X 65-3/4” – ¼” in school cafeteria. Dulce Indian Health Service – Paint Dulce, NM ZCI provided all necessary labor, services equipment, tools, materials, and supplies to accomplish the drywall repairs and repainting the Janitor closet. ZCI furnished janitorial supplies for Tiss Nas Bus Community School. ZCI demolished existing concrete slab at Building 641, south wall and installed new concrete slab to meet specifications requested. ZCI renovated offices at turbine deck at the APS Four Corners Power Plant. Included drywall repairs, interior wall prime and paint, installation of new entry doors and door hardware, installation of office cabinets and new break area location, as well as custom countertops and filing cabinets. Installed new refrigerated a/c units at each office location. Office One, housed 7 desks. Second office housed 10 desks. ZCI made drywall repairs to a 6 man office space. Repainted walls , installed dry erase boards, cabinets, custom desks for 6 stations, as well as a coffee break station. Installed shelving at back room location. Included paint and drywall repairs. ZCI furnished and installed window blinds for T’iss Nazbus Community School for Building 658. ZCI provided doors and associated hardware for US Dept of Energy Bldg. ZCI removed and replaced existing carpet, tile and base line in the boys and girls wing in building #453 and 6th grade classroom in building 456. ZCI provided Construction treated lumber and materials and replaced the bridge decking on N642, Kilichee. ZCI performed troubleshoot on electrical wiring. Removed and replaced flagpole light fixture. Removed and replaced 5 interior light fixtures. ZCI installed 545 sq ft of VCT tile for men’s restroom, women’s restroom, men’s locker room, women’s locker room and hallway at building #30. Included necessary floor prep and leveling for proper installation. Design Build for a 1500 sq. ft. Warehouse. This project included site excavation, installation of a 30’ x 50’ concrete slab with stem walls and piers to support construction of a new commercial metal building located at the Nenahenzad Chapter House property. This included the erection of a Metal Building approx 16’ tall, Installing the Red iron framework, insulation, all electrical fixtures, outlets, all associated wiring and service box installation, installing two mechanical bay doors, installing the pro-panel skin, 6 skylights, trim out at exterior, and roofing system. All work was designed by ZCI and Self Performed by ZCI Team. ZCI was hired to install approximately 12,208 sq ft of VCT flooring material and 2,520 l.f. cove base. ZCI demoed old existing flooring materials and old cove base to be replaced with new flooring materials. Installed new vinyl to the hallway and main waiting area. 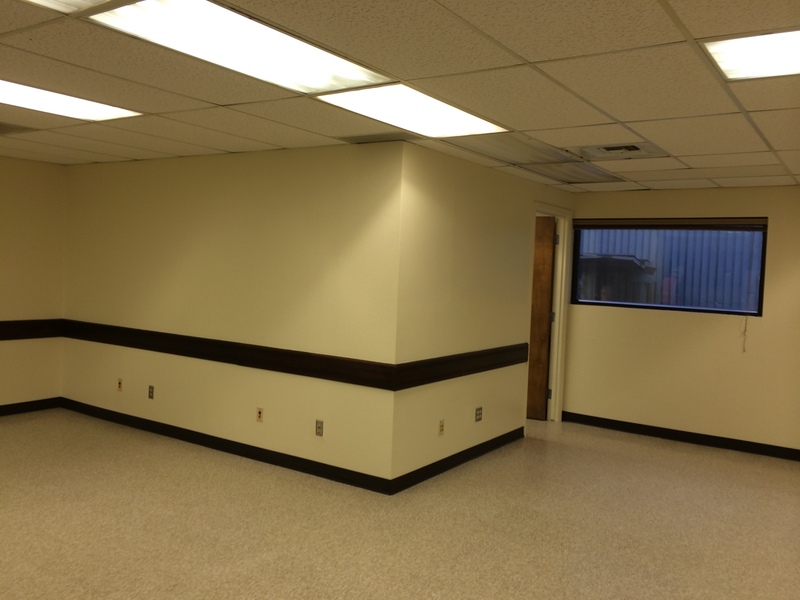 Approximately 3,630 sq ft commercial grade flooring including cove base and remainder of rooms. 28 unit office space and 3 waiting areas. Total sq ft was 15,838 flooring. ZCI converted one room at 3rd floor APS 4/5 Building to Operations Kitchen Space. Included demo of damaged drywall at ceiling location and demo, clean up. 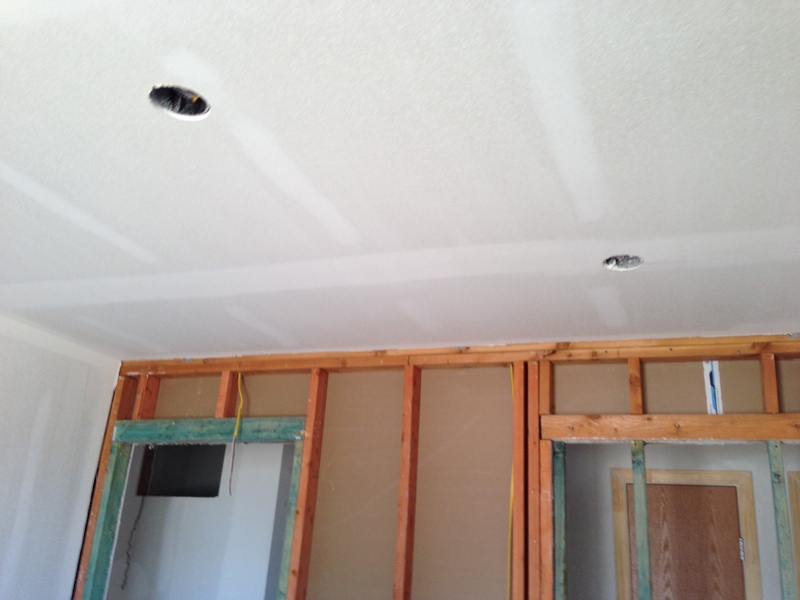 Installed drywall and also included drywall patch repairs. Plumbing, water supply connections and drain runs were installed. Plumbing included a two compartment sink, fixtures and all associated attachments, one garbage disposal, and one 6 gal water tank for hot and cold water for sink location. Cabinetry, hardware and counter top included. Four new light fixtures installed in ceiling. Provided appliances; two refrigerators, one electric range, and one microwave oven included in bid. 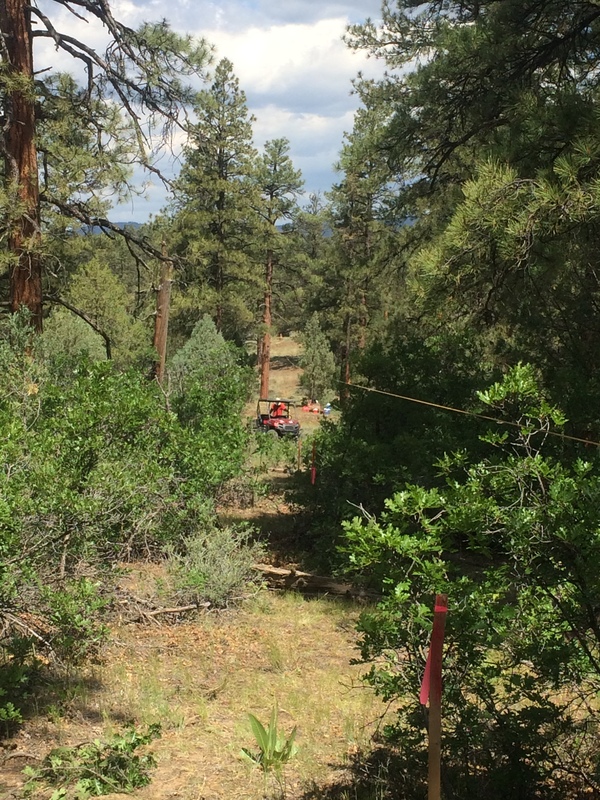 ZCI provided bridge materials for a historical structure at Mesa Verde national park. Materials: were 22' long DF#1 Rough Cut Logs, 6' DF#1 KD logs, 10' DD#1 KD, and Pole Barn nails with delivery to be FOB. Completed October 2016. ZCI will remove existing system and will provide and install a two new Ductless Dual Zone (heating and cooling) one for Lavatory and one for main office- split system at Hubble Trading Post. One 208/ 230 V single (we assume the existing electrical will be compatible with existing system. All existing copper tubing will be re-used in bid. ZCI preformed daily job site cleanup and haul off to qualified landfill. The wall mounted indoor units will be installed and each will have its own condenser to include all wiring. All electrical work if necessary and connectors re-used of condenser pad for ductless system and wall mounting brackets were also included. Completed October 2016. ZCI replace 650 lf fencing on the property of Tohatchi Health Care Clinic. Scope of work included purchase and installation of the following 650 l.f. of Fence fabric at 5' tall, with top rail to divide hospital property from private residences. All associated galvanized posts, gate posts, corner/end posts, 1 four foot wide pedestrian walk posts and line posts per specifications all to be installed at 18-24" depth with quickcrete. Posts will be schedule 30 and line posts will be schedule 20. Install top rail, tension wire will be 11 ga with hog rings for bottom of fence fabric. ZCI will all necessary hardware to install fencing materials: tubing, tension bars, and caps. Gates will be commercial grade and will be framed with tubing, to include hinges and latches for a wide to 4' wide pedestrian walk gate. ZCI demo scope consists of existing barbwire fence and posts. Debris was hauled away to a qualified landfill. Installation will be digging of post hole labor and quickcrete for additional support, installations of posts, rails fence fabric and stretching including gate. Some light grading with bobcat skidsteer. Jobsite will be cleared of all underground utilities. All fence prep at site performed at site. Completed October 2016. ZCI sealed firewall at 14 designated locations per site visit investigations on 6-9-16 at the Tohatchi Health Care Center. ZCI intends to use Fire Barrier sealant caulk at penetrated firewall locations. Fire-Barrier Sealant Caulk will be applied on both sides off wall penetrations. Penetrations that exceed ¾" - 1" will have 5/8" Fire Core Gypsum Board installed per site visit and per code. Work included all labor, tools and equipment, mobilization for above said location. Daily job site clean up to be done of work area and all debris to be hauled off to a qualified landfill. Completed September 2016. Scope included the painting of 16 exterior hollow metal doors and 665 l.f. of two fence rail system. Paint work , as it relates to exterior doors & tube fencing per site visit. ZCI cleaned and prepped and sanded all metal surfaces (including: doors, frames and 665 of hand rails at 500 N. Mundo Drive.) Door signs to be properly masked off to insure no damages to sign. Three doors were repaired by applying bondo and sanding down to match existing surfaces. All paint surfaces will be prepped and cleaned as needed to receive paints (ALL Paints to be provided by Hospital per Don Smith and additional paint by ZCI and use paint provided by Hospital). All Fence railing will be primed and painte . Rail locations are to be: Front of Parking lot at east side, Staff parking lot stairs at north side (bid includes rust damage repair at this location also), Patient entrance stairs, Patient Handicap ramp, and stairs at playground location. Completed September 2016. ZCI provided electrical and mechanical materials and workmanship at DATA/IT Building for GIMC Located at Gallup NM. ZCI to provide all labor, supervisory labor tools, NO materials, supplied and fabricated all ducting to be installed for two 5 ton HVAC units at roof location. Also did all penetrations at roof locations and completed all duct work connections, electrical work and gas were also supplied to the North RTU and the South RTU. ZCI also provided and installed electrical supplies, conduit etc., transport of equipment, mobilization to site, duct fabrication/order by client for ZCI team to install. ZCI team also installed insulated duct system to central trunk system also fabricated. Scope also included flexible insulated ducts, vents, cone vents, grills, Return Runs and Supply Runs. Fed vents and returns to feed into each designated locations per drawing provided in solicitation. This will include installation of client provided: registers, diffusers, inlet boxes, cone diffusers, flex connections, screws, sealants, vent grates (vents to fit a 2'x2' ceiling grid). ZCI provided all equipment: Ladders, scaffolding, PPE, Safety Gear, Signs, Barricades for vehicles and work area in bid. 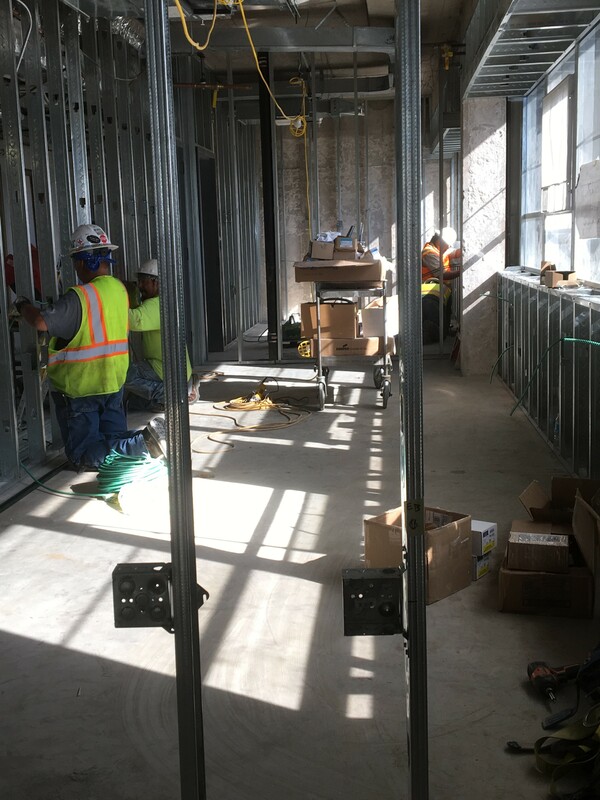 Labor are for installations only of the following: electrical supply installations, electrical rigid conduit, electrical wiring, breakers, switches, relays, florescent fixtures (2x2 fixtures), and as-builts. All installations will be tested for balance and for proper electrical loads and tested for proper function. Labor Installations are for the following: will be done according to lay out of HVAC Mechanical layout provided. Completed August 2016. ZCI installed one electrical heater at north wall location with duct, vent, thermostats and electrical connection at a new location. Completed August 2016. 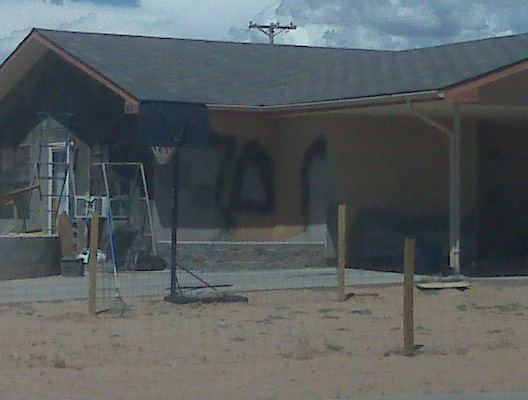 Worked on a two story vandalized house. Completed minor drywall repairs at Stairwell location, 2 bedrooms, and two exterior door locations (Front and Back). One window was replaced and 3 doors were repairs (Front door, back door and pantry door) included door jamb was removed & replaced, reinsulated, primed and repainted. Kitchen Fire Extinguisher replaced. Completed July 2016. ZCI completed electrical repairs and upgrades to Conference/Veterans hall at the Chapter House. Electrical add on were included which resulted into change orders. One change order for electrical receptacle added on to original scope. The majority of bid was installing lights fixtures, installing breakers and testing electrical system. Completed July 2016. ZCI did door repairs on a hollow metal door. Included re-installation and also door kick at 4th floor location of Sulfer Lime Building at APS Compound. Completed June 2016. ZCI installed 8 new windows at a Historical Park Staff Quarters Cabin. Windows provided were provided by Park Service. Wall windows will be specified per SOW and provided window specs. Bid included removal of windows and disposal in an qualified landfill outside the park location. Existing trim was removed on an as needed basis and reused. Damaged trim will be replaced (primed and painted). New clads will be installed to include all equipment, tools, labor, materials (Shims, caulk, touch up paint, screws, insulation batting and exterior window sealant) to complete job in a professional workmanlike manner. Additional framework was required at all window locations as windows provided to our team were too small. All windows were trimmed out and completed to proper finish with existing rough opening. All efforts to prevent unnecessary damage will be executed as these are historical quarters. Completed May 2016. ZCI did Acoustical Ceiling Repairs to the Main street Barbershop located on main street in Farmington. Light commercial job. Work included repairs to ceiling grid and ceiling tile and re-installing existing 2x4 florescent drop light fixtures. Completed May 2016. The entrance of the Tohatchi Health Care Clinic, ZCI demo'ed existing floors tiles of 650 sq. ft. at entrance location of clinic. Removed and replaced the floor tiles with new spec'ed VCT tiles. This included floor leveling of concrete floor. ZCI crew disassembled and reassembled cubicles from Fort Wingate and transported to Tohatchi Clinic. A three room cubical reception office was installed to receive new patience. Cubical assembled. Installed All Electrical and Data Lines for Phone for computer and phone systems. ZCI built three customized doors for cubicles, included door hardware; locks, hinges and door stop. Completed April 2016. Demo vandalized unit. Removed and installed all windows and exterior doors, damaged interior doors including all the closet doors and outside closet doors, damaged floor tile, damaged electrical, damaged stucco at exterior, damaged restroom, kitchen cabinets, and drywall repair. ZCO Primed and painted entire interior of home. Repainted stucco at exterior where damage occurred and graffiti occurred. ZCI painted new exterior doors back and front door and two storage doors, all new door hardware at interior. ZCI did drywall repair of the bedrooms, restated the cabinets, painted the interior of the whole house and repainted around the exterior of the house. ZCI fixed plumbing issues in the bedroom and kitchen (new sinks and faucets). ZCI also installed new furnace and new water heater and exterior water spigot repairs. New electrical panel installed and reconnected to NTUA Standards. Completed April 2016. APS Four Corners Plant – Warehouse Renovation Fruitland, NM APS hired Zohnnie Construction convert warehouse into office space. ZCI demoed and frame 28 additional offices and was responsible for all electrical, heating and cooling HAVC for building. The required outlets and light fixtures were installed in each office/cubicle area as well as the data connections required for their office space. Next the acoustical ceiling and VCT flooring was also installed in all 28 offices and common area of APS warehouse. Completed February 2016. To correct lighting issues for Santa Rosa Day School parking lot Zohnnie Construction designed a layout for the installation of 19 exterior LED light poles. 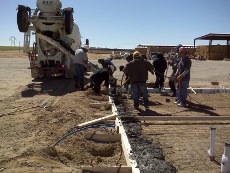 A concrete base was poured which supports the 10’ light poles. These light fixtures have new cut-off LED lamination and provides the necessary lighting needed for the Santa Rosa Day School parking lot. Completed December 2015. All office furniture was removed and entire building was masked off to prepare for abatement on carpet and tile. Flooring was then properly disposed at an EPA waste site. 5,000 sq. ft. of carpet and VCT tile was then installed throughout building and all office furniture was moved back in to building. Completed December 2015. 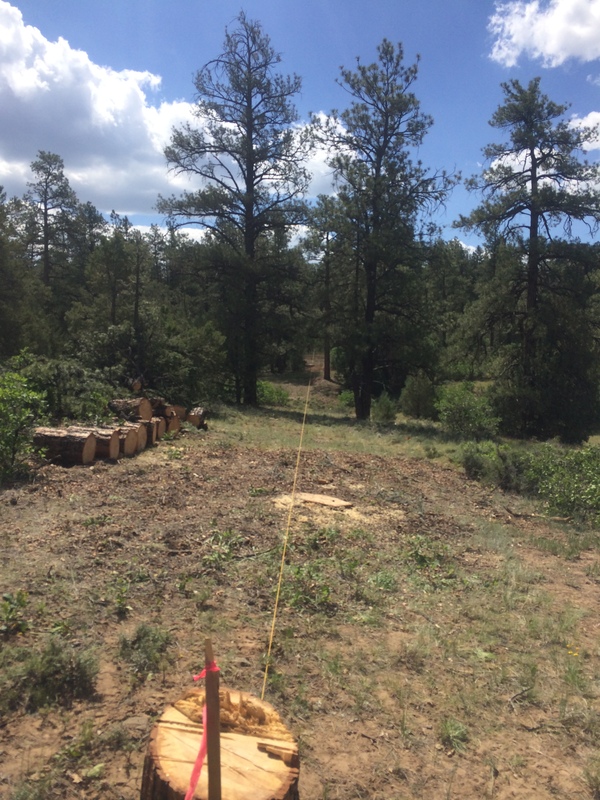 Huerfano Chapter – Landscape Huerfano, NM Demoed existing trees and shrubs and then prepped landscape to received 6,530 sq. ft. of sod. Once sod was planted ZCI then selected heat and low water tolerant plants to be planted and arranged in landscaping as well as new threes. 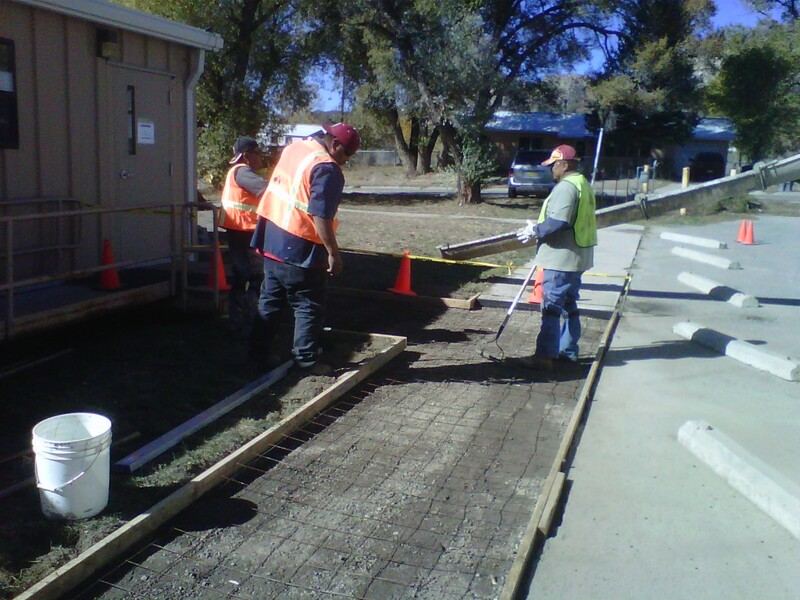 Picnic tables, benches, and trash receptacle were also placed on Huerfano Chapter grounds. Completed October 2015. 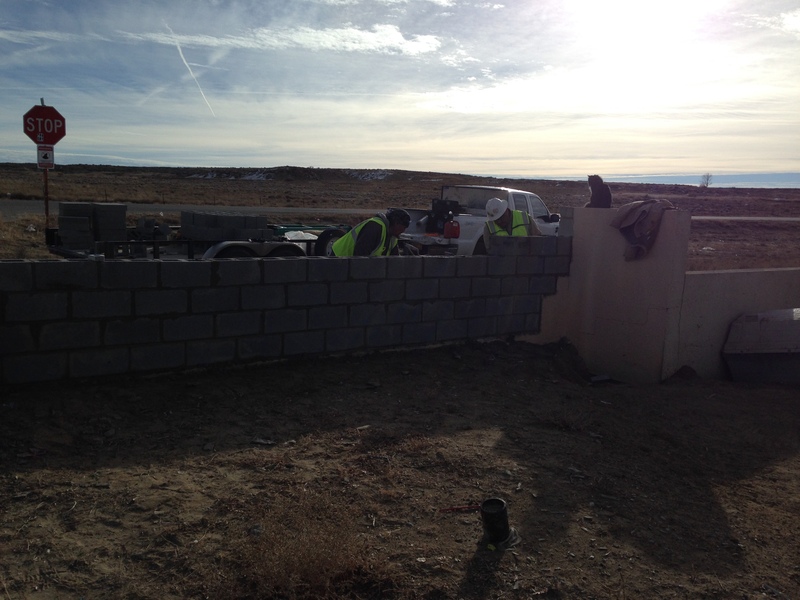 Zohnnie Construction installed drywall in 7 scattered NHA units throughout the Navajo reservation which consisted of hanging drywall, mudding, sanding, and texturing each unit. Completed September 2015. Repaired and sealed leak on AC unit to prevent water damage to roofing and interior drywall at Huerfano Youth Center gym. Completed July 2015. Sky City Community School hired Zohnnie Construction to do stair repair to resurface/reface concrete with a broom finish to prevent slipping hazards. Completed July 2015. Zohnnie Construction repaired siding on Huerfano Youth Center building where galvanized propanel was installed and properly insulated. Completed July 2015. The Chapter hired ZCI to excavate plumbing lines to gain access to septic tank clean out and to do a water test so toilets and urinals would be in working order. Removed outside water faucet, water supply line and capped off drain line. Two broken copper lines were removed and replaced. Lastly electrical light fixtures were rewired. Completed July 2015. For this NHA unit the old windows were removed and replaced with energy efficient windows in the kitchen, dining room, and bedroom. Completed June 2015. Zohnnie Construction was hired to repair a leaking waterline. Completed June 2015. Renovations for this unit consisted of drywall repairs, texturing, freshly painted walls, and installing new baseboard. All through the unit new passage doors and closet doors were removed and replaced with new passage and closet doors, light fixtures and wall outlets were also installed. Lastly energy efficient windows were replaced throughout unit and the exterior siding panel was repaired and painted to match existing exterior panel. Completed June 2015. Zohnnie Construction was selected to maintenance swamp coolers at APS Power Plant. Maintenance consisted of replacing all AC pads, making sure all motors were in proper working order, cleaning and sealing cooler pans, checking belt drives, greasing bearings and any necessary repairs for water supply line. This work was performed at various locations throughout plant site. Completed May 2015. 1,386 sq. ft. of flooring was removed as well as cove base and baseboard. The floors were re-leveled and new VCT tile was installed and new cove base and baseboard were also installed. In addition to this work a 6 panel metal door was replaced with new and improved metal door. Completed May 2015. ZCI located leak in roof, removed shingles and plywood that had water damaged. Next new decking was installed where leaking was located and roof was re-shingled to match existing roof. Water damaged drywall was then removed and new drywall hung, textured, and freshly painted. In addition to these repairs the gutters were also replaced as well as the stove pipe. Completed May 2015. ZCI professionally removed mold found in an exterior wall due to moisture exposure. Once mold infested materials were properly removed ZCI reinforce structure of wall by building studs to strength wall support. The wall was then insulated, installed plywood, fiber board, vapor barrier, and stucco to match. Wall then received fresh coat of paint to match existing exterior walls. Completed May 2015. Zohnnie Construction installed energy efficient windows, removed mold in bathroom, repaired drywall, textured and freshly painted bathroom. Sink base in bathroom was replaced and VCT tile was installed. Completed April 2015. APS hired Zohnnie Construction to remove and replace 962 sq. ft. of ceiling tile in administration building. Competed March 2015. This NHA burnt unit that required ZCI to remove and properly dispose of fire damaged drywall, windows, flooring, counters, and cabinets. Damaged electrical was repair. New drywall was hung and textured, freshly painted with new flooring installed throughout unit. Windows were also replaced that had either melted or bust due to fire, new appliances and fixtures (i.e. cabinets, counter tops, vanities, etc.) were also installed. Completed March 2015. APS hired Zohnnie Construction to remove existing electronic sliding door and to install manual double doors with heavy duty hardware. Completed March 2015. Removed 48 sq. ft. of damage roof deck and then installed of approximately 1,484 sq. ft. of 29 gauge metal propanel. Drywall repairs to the interior consisted of mudding, texturing, and freshly painting walls. Lastly 2 energy efficient windows were installed. Completed March 2015. ZCI repaired sewage piping under sink in restroom. Remove and replace VCT tile, install cove base throughout restroom and locker area. Replaced and reconstructed wall where urinals are located. Lastly did concrete cut under sink and rebuilt pee trap. Completed March 2015. Flooring installation consisted of removing approximately 2,250 sq. ft. of carpet tile, mastic, and cove base. Parts of the floor had to be re-leveled and installed new VCT tile and cove base to finish. Completed February 2015. Collected abatement samples for Preschool Building at Upper Fruitland Chapter. Completed January 2015. 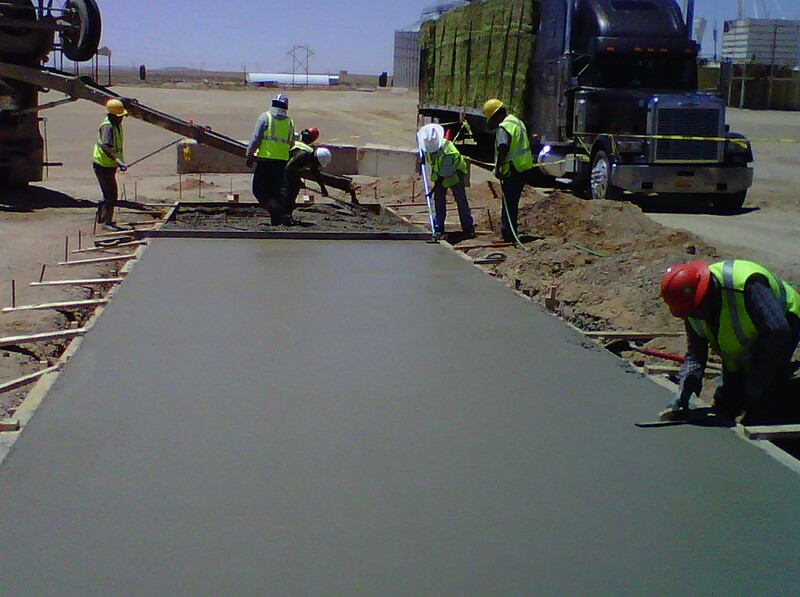 APS Four Corners Power Plant – Concrete Fruitland, NM APS sidewalks were tripping hazards which had to demoed. 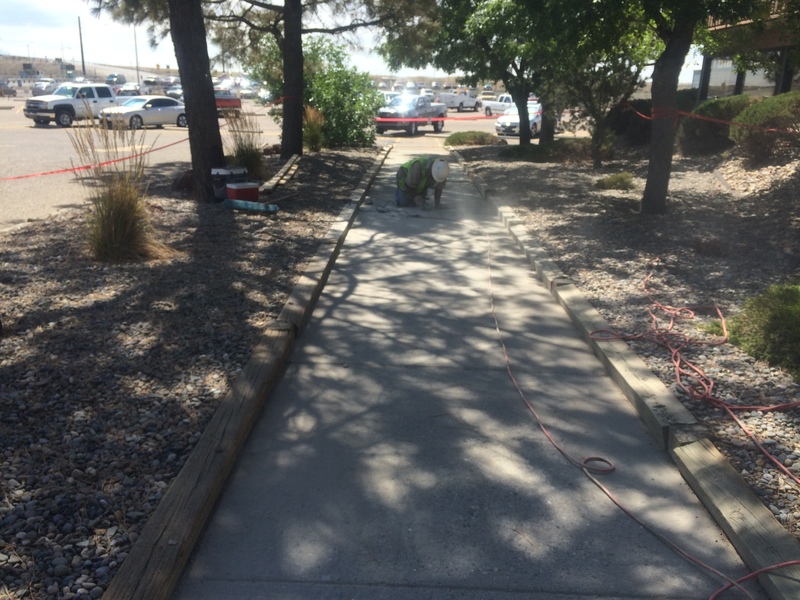 Soil was re-compacted and formed to pour concrete sidewalks. Flume gate and gate drains were also designed for better drainage to prevent sidewalks from buckling and water accumulating and freezing during winter season. Completed January 2015. Renovated storage unit which consisted of replacing collapsing ceiling and replaced walls due to root growth that was interfering with storage unit. Ceiling and walls received new drywall, mud, texture and painted to match existing walls. New hardware was also installed and locks were changed. Completed January 2015. NHA hired Zohnnie Construction to remove existing tile and repaired subfloor near entrance. Once subfloor was repaired ZCI then installed VCT tile throughout unit. Completed January 2015. APS Four Corners Power Plant – Roof Repairs Fruitland, NM APS selected Zohnnie Construction to remove existing roof and install new 26 gauge high rib propanel. Completed December 2014. 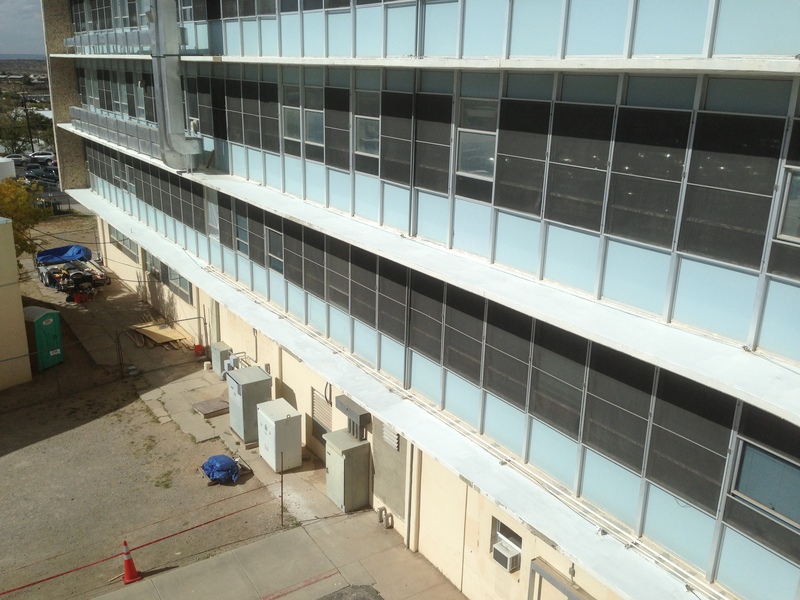 Zohnnie Construction repaired doors, door glass replacement, and install sweepers for APS Power Plant. Completed December 2014. Zohnnie Construction was chosen to create a conceptual map for chapter utilities, sewer and water system, slopes and topography and scared sites. Completed December 2014. APS hired Zohnnie Construction to paint yellow striping at APS pedestrian walkways at west parking lot, vendor’s parking lot and trucks at fence line. Completed November 2014. ZCI repaired a 6’x 12’ section of brick wall and also repaired the exterior stucco damage. Wall was repainted to match existing wall. Completed October 2014. Zohnnie Construction disassembled and relocated shade structures to xeriscape location where shade structure was reassembled. 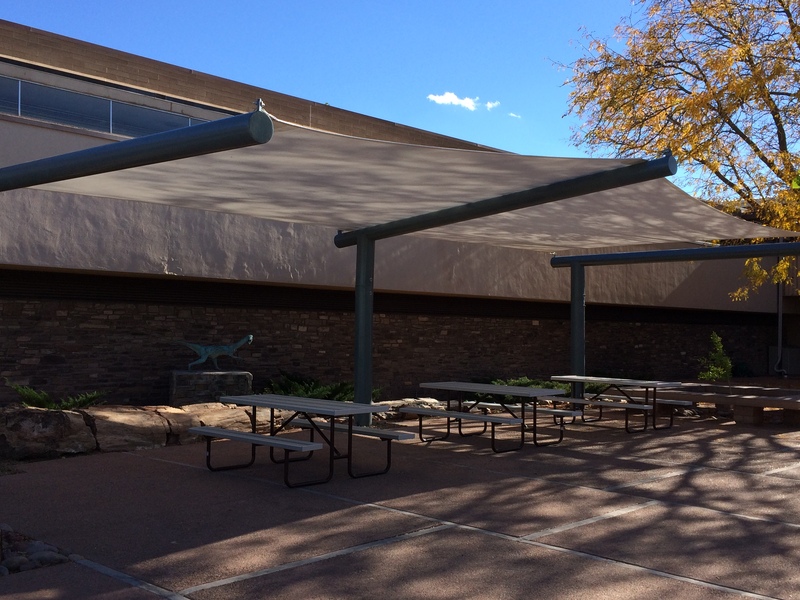 ZCI supplied and installed new shade structure at visitor’s center. Completed October 2014. Zohnnie Construction installed new cabinets and replace all acoustical ceiling tiles, primed and painted drywall and masonry wall. ZCI also installed VCT floor tile, cove base, and framed walls to create offices. Performed finished work for all offices and installed cabinets, countertops, sink fixtures and garbage disposal. Completed September 2014. 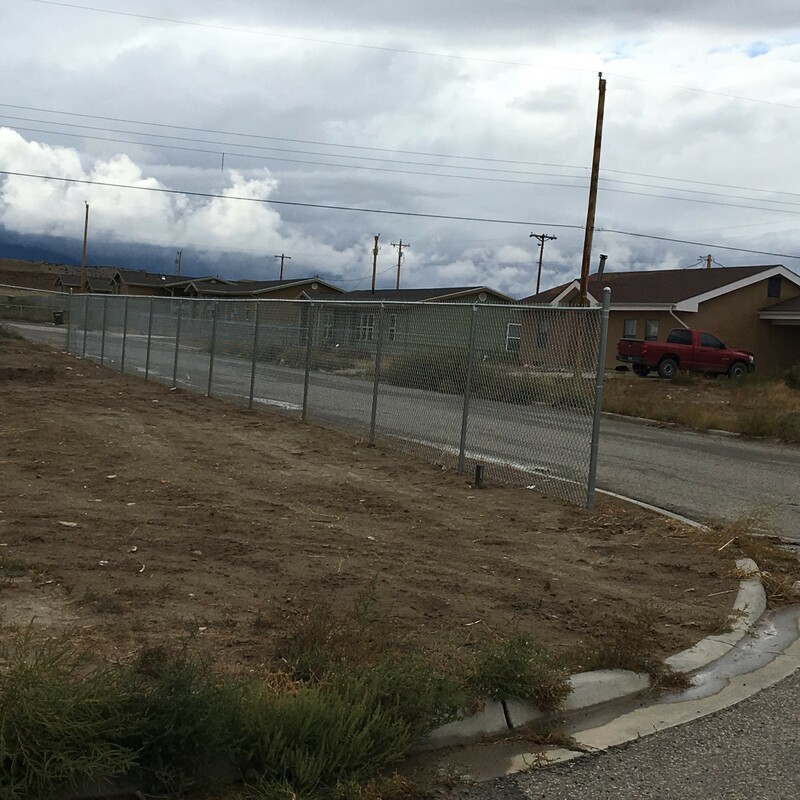 Shiprock VFW hired Zohnnie Construction to build a fence and to install wide swing gates which included fabric fencing with tall posts and railings to provide privacy. Completed September 2014. Four Corners Power Plant hired Zohnnie Construction to repair 19 doors in 19 different locations throughout the plant. Repairs also consist of door knob, hinge and sweeper replacement. Completed September 2014. Zohnnie Construction renovated unit starting with the stucco repair and painted to match existing exterior walls. Some interior walls were repaired and painted to match wall color in kitchen, living room, and in all bedrooms. New flooring was also installed as well as electrical and plumbing repairs. Completed September 2014. 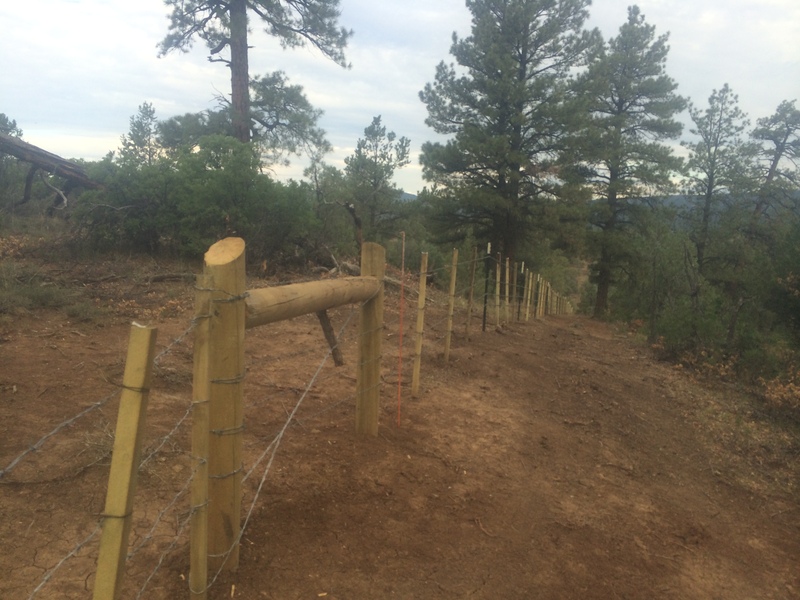 Southern Ute Tribe selected ZCI to installed 2.9 miles lay-down fence on cultural sensitive land for at Cat Creek. Completed August 2014. 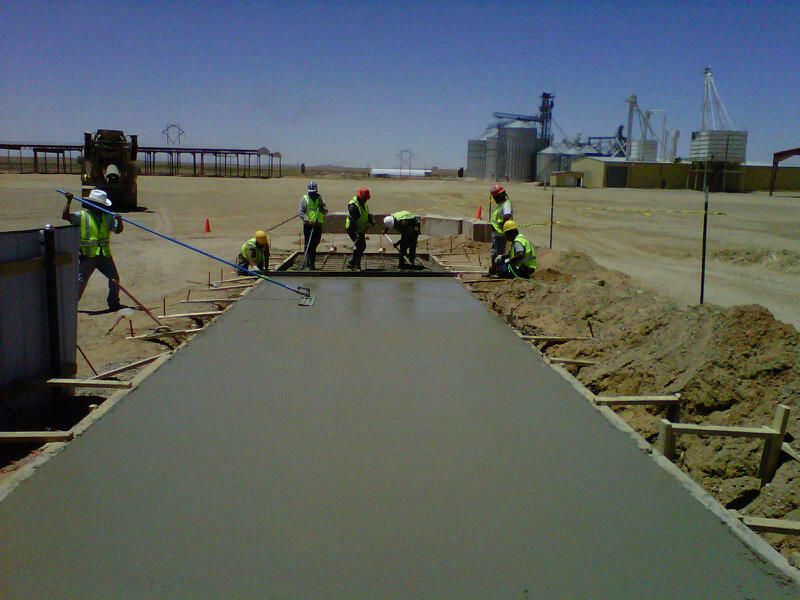 APS Four Corners Power Plant – Concrete Fruitland, NM APS hired Zohnnie Construction for concrete work. 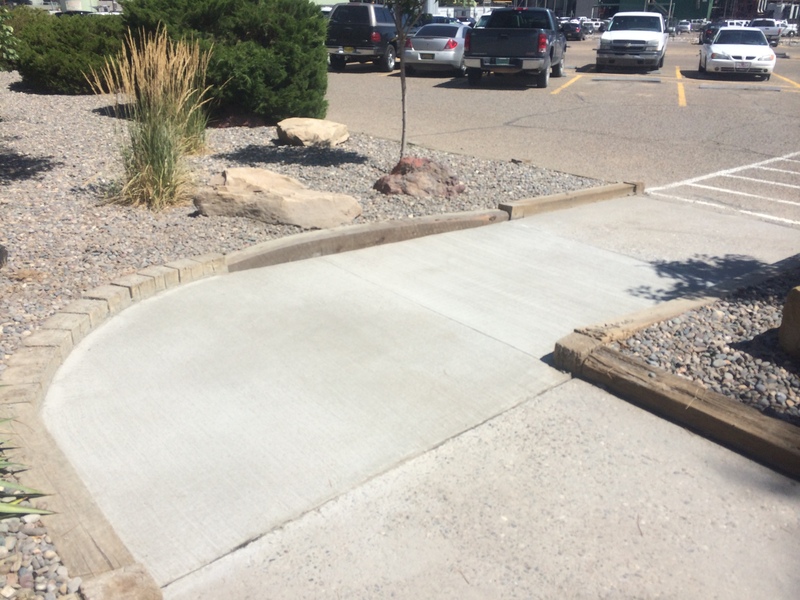 4 slabs of concrete were replaced and evened out by grinding, remove and poured one section of concrete approximately measuring 10’x3’. Completed August 2014. 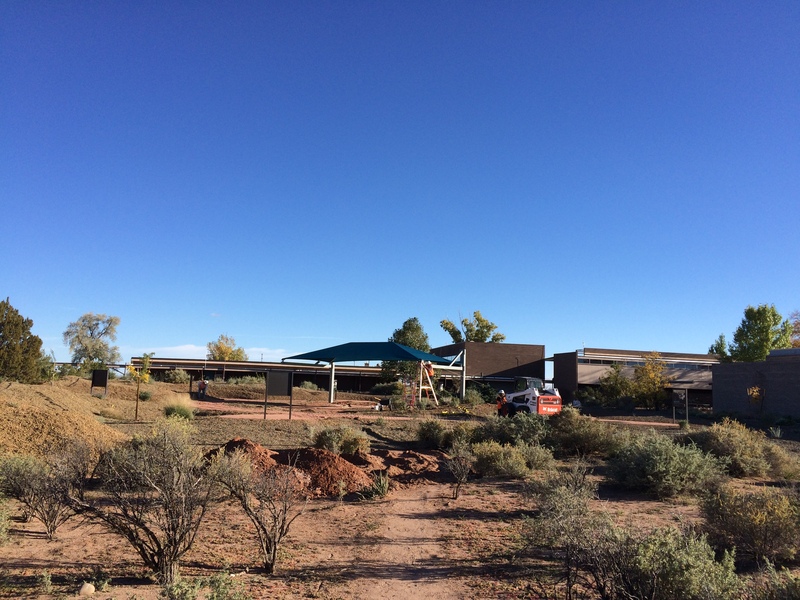 Zohnnie Construction replaced a blower motor in furnace at Chinle Chapter. Completed August 2014. The removal of 475 l.f. of 4’ tall chain link fence was properly disposed at an EPA waste site. ZCI then installed posts and poles in concrete for the 475 l.f. of 4’ tall chain link fence around the perimeter of building. The chain link fence was lined with fence fabric to provide privacy. Completed August 2014. Repaired existing doors as well as install new doors with thresholds and painted newly installed doors. Demoed the interior wall which then received new drywall, texture, and painted to match existing walls and new VCT tile and cove base were installed. Completed July 2014. APS Four Corners Power Plant – Plumbing Men’s Restroom Fruitland, NM APS hired Zohnnie Construction to clean men’s restroom in the administration building where new flash valves, new gaskets, and vacuum breakers and seals were installed. Completed July 2014. In the SO2 building need tile installation which required the removed of existing carpet and some tile which was properly disposed at on site trash bins. 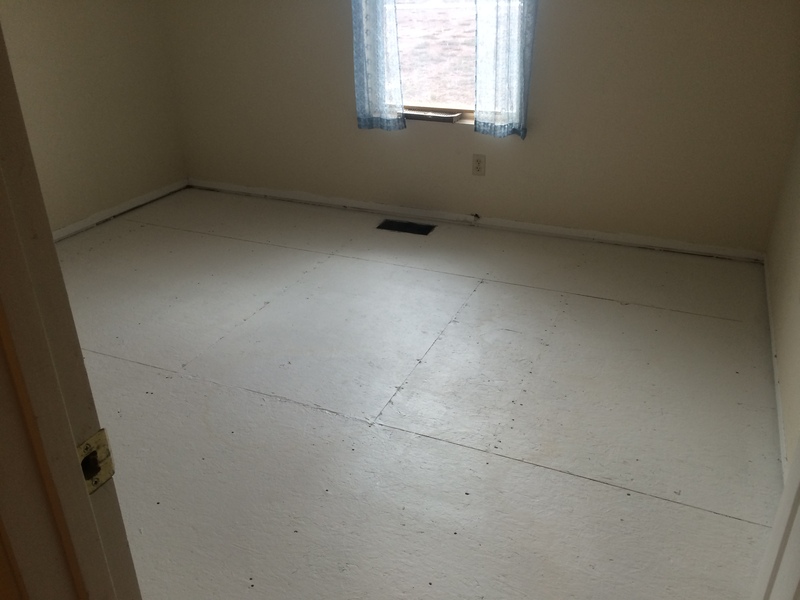 ZCI had to scrap some mastic and relevel floors to properly install in multiple rooms. Lastly cove base was installed in all rooms and common area. Completed July 2014. Zohnnie Construction removed old stair treads on concrete stairs and installed new stairway treads on concrete stairs to prevent slipping hazards. Completed June 2014. Maintenance swamp coolers at APS Power Plant. Maintenance consisted of replacing all AC pads, making sure all motors were in proper working order, cleaning and sealing cooler pans, checking belt drives, greasing bearings and any necessary repairs for water supply line. This work was performed at various locations throughout plant site. Completed May 2014. New Comb Chapter hired Zohnnie Construction to provide a community land-use map for New Comb Chapter in New Comb, NM. In the map contained chapter bounty area, slope with contours and elevation, BIA study forage/land/status/grazing potential, NHA study, zoning area for community and economic development, power lines, roads, and sacred sites, archeology sites and reference registry for BIA data. Completed December 2013. Renovations on COO and CEO executive offices at NAPI headquarters stared with correcting abandon floor drain which was patched and leveled. Some dry wall and texture in executive bathroom were repaired as well as installation of new pedestal sink, shower head, and plumbing addressed to accommodate new plumbing upgrades. In executive offices new coats of paint were applied, new cabinetry and shelving built and new ceiling tile installed in both offices, lastly new wood flooring installed in the executive offices and bathroom. Completed December 2013. 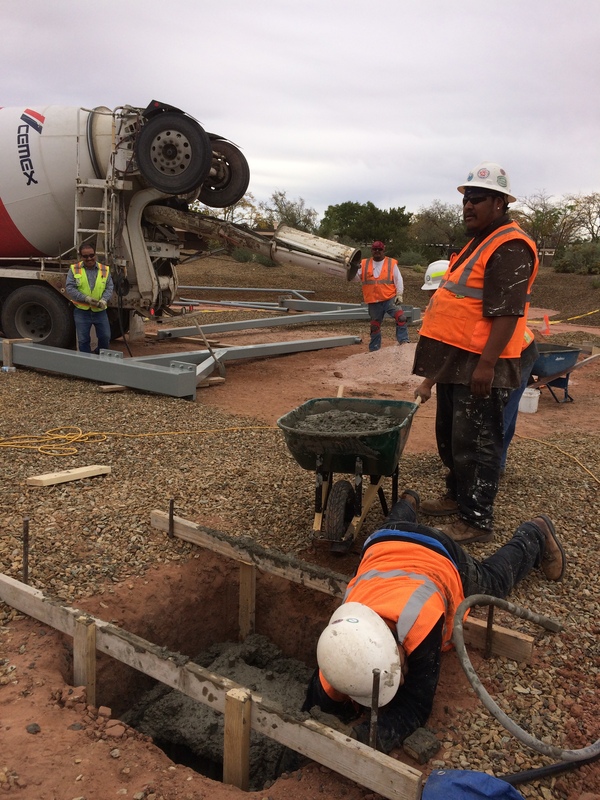 ZCI was responsible for repairs to the concrete landing on the exterior of the Gallup Indian Medical Center which is a multileveled building. The concrete landings were power washed to wash away loose debris then resurfaced at a number of locations where drainage on landing was pooling. Lift was used in aiding worker to reach heights and harnessed in at all times. In addition to resurfacing ZCI also repaired/filed in chunks of that were missing from the concrete landing. Once repairs were completed every landing was primed and painted on each level of the hospital. Completed November 2013. To correct drainage problem Zohnnie Construction installed grate drain system which included cutting in to existing concrete sidewalk, re-routing gutter for proper drainage for two commercial buildings. ZCI installed approximately 140 LF of 4” PVC pipe for commercial buildings. In addition ZCI designed and installed concrete flume approximately 78 LF. Completed November 2013. Zohnnie Construction installed a temperature unit and door jamb APS Four Corners Power Plant. Completed September 2013. ZCI serviced coolers in U7 and MTC shop which included replacing water pumps, pads, and bearings on wheels. Completed September 2013. Air conditioning unit was serviced which included cleaning out coils and unit, changed filters, check refrigerant and etc. Completed August 2013. ZCI serviced several coolers in NPDES Building which included changing pads and sealing coolers, changing floats, drive belts, motors and broken water lines. Completed August 2013. Zohnnie Construction installed 25,000 BTU cooler in SO2 Lime Building for APS Four Corners Power Plant. Completed August 2013. Removed and replaced acoustical ceiling tile in 4/5 Control room and AO room. Completed July 2013. Fifteen window installations and 2 door exterior doors replaced by Zohnnie Construction. Completed May 2013. 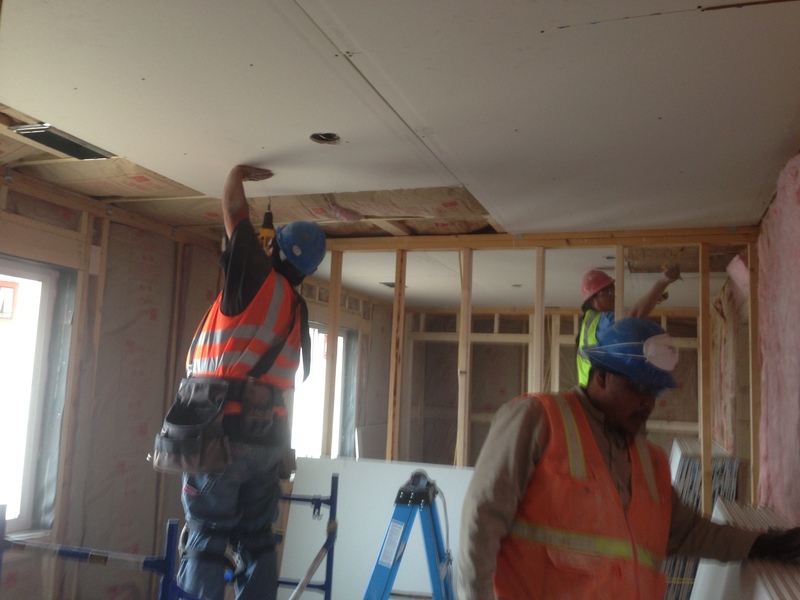 ZCI installed drywall in 30 units as well as taped, mudded, and textured all 30 units. Completed May 2013. Zohnnie Construction installed exterior door and replaced an interior door. Completed May 2013. Repaired brick siding and brick porch to match existing brick due to fire damages. Once repairs were made ZCI painted brick to match exterior paint. Completed April 2013. VCT tile was installed in E & I training room at Four Corners Power Plant. Completed April 2013. ZCI removed and replaced metal door for Four Corners Power Plant in the Lime building. Completed April 2013. 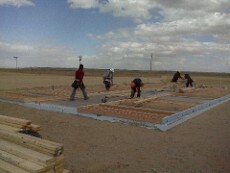 Zohnnie Construction provided flooring installation for 29 units in Tahajiilee New Mexico. Fire damaged unit required several window installations. Fascia, gutter and downspouts were also replaced do to fire damage in addition to repairing support beam and soffit panels. Stucco also sustain fire damage which Zohnnie Construction cut and removed then repaired to paint and match existing stucco on unit. Completed April 2013. Zohnnie Construction purchased and delivered material for unit #51. Completed April 2013. ZCI repaired burnt kitchen cabinets, broken drywall damaged, and installed exterior metal door and several interior doors. Repairs to the bathroom were also done as well as fresh coats of paint applied to entire interior walls. Completed April 2013. Zohnnie Construction renovated office space for Fleet Management office for the Navajo Nation. Drywall work, fresh paint, baseboard installation, window installation, and vent and duck work relocated due to fumes entering office space. Electrical relocations for lighting in office space were also part of renovation. Completed March 2013. Completed flooring finish work as it relates to concrete staining and concrete sealing throughout various locations in San Juan County building. Use of ECO Products as project was a LEED Project. Area was two stairwells and 9 utility locations for flooring finish. ZCI was hired to troubleshoot two malfunctioning A/C systems. We installed missing contactor on the North unit, replaced thermo-static expansion valve, and recharged the unit with new R-22 refrigerant. On the south unit, we replaced the condenser fan motor, belt, pulley, re-wired the control circuit, and fabricated new cap for exhaust valve fan termination. An expansion valve cage was also repaired. Test runs were completed. Total area was 5,500 sq. ft. Completed July, 2012. Administration Building - ZCI replaced basement doors with new closures, seals, and weatherstripping. Unit 4/5 Basement – 3’ x 7’ commercial grade passage door and closures installed. Unit 4/5 SO2 Lime/Sulfur Building – Eight feet height double-doors were replaced, along with closures, seals, and new sweeps. SO2 ABS Building – New LCN door closure was installed with new GRB 30 passage knob; the mortise lock was also replaced. Unit 1, 2, 3 Scrubber Service Water Building #17 – Two 30” wide doors and one 36” wide door were replaced with new closures, sweeps, and thresholds. Light earthwork and site clearing, grubbing, installation of 237 lf. chain-link fence for new playground site, installation of playground equipment, swing set, timber boarders, and rubber mulch. Completed March, 2012. ZCI performed stucco damage repairs to residential unit #8. Completed February, 2012. ZCI performed stucco damage repairs from a fire at one end of the home. ZCI replaced insulation, wire netting, felt paper, scratch coat and finish coat. Scope of work also included soffit and fascia removal and repairs. Completed February, 2012. Scope of work included vandalism removal and clean up, included roofing repairs, replacement of roof decking and new roofing system, insulation installation, plumbing repairs, install HVAC system, electrical wire removal and replacement, interior light fixtures, installation of drywall at interior, tape and texture, prime and paint for interior, removal and replace all windows, installation of cabinetry, remove and replace all interior doors and closet doors, install VCT tile flooring throughout home, installation of all plumbing finishes, interior trim finishes (base boards, etc). Completed March, 2012. This project includes site excavation, installation of a 30’ x 50’ concrete slab with stem walls and piers to support construction of a new commercial metal building located at the Nenahnezad Chapter House property. 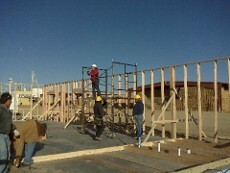 Project is ongoing through February, 2012. Drywall repairs were completed to damaged interior drywall. Completed December, 2011. Twelve foot bay door removal and replacement. Change order involved replacing damaged supporting door jamb, replacing burned-out motor with new motor, electrical installation, increasing door height by 2 feet, raising and re-welding the header, and replacing existing track assembly to accommodate new door height. Completed December, 2011. New porch cover, approximately 10’ width by 54’ length, constructed to provide cover to existing 10’ by 50’ wood deck adjacent to mobile home. Construction included setting vertical support posts in concrete footers, bolting posts securely to existing structure, roof frame-out, applying roof decking, roofing paper, and pro-panel sections. Flashing for drip edge trim-out was installed. Completed December of 2011. The National Park Service hired ZCI for window and door renovations for nine staff housing units at the park. ZCI completed an inventory of existing doors and windows that needed to be replaced. Old windows were removed, framing was modified to accommodate new window sizes, new energy-efficient windows were installed, finishing was completed along with new exterior paint per specifications. ZCI crew also replaced the existing French door assemblies with new hardwood French doors, completing reframing as necessary. The park service also requested that we furnish and install new wooden screen doors at each French door opening. Completed December, 2011. ZCI furnished all materials and labor to complete extensive renovations for five houses. Work included new bathroom cabinets, tub/shower enclosures, toilets, drywall and subfloor repairs, plumbing repairs and upgrades, new medicine cabinets, new interior and exterior doors (reframing as required), new screen doors, new kitchen cabinets, countertops, and sinks, new flooring including carpeting and tile, new energy-efficient windows, taping and texturing drywall, priming and painting interiors and exteriors as required. Completed December, 2011. Emergency call-out for flooding issues at Fort Defiance Youth Development Office. Back-flow repairs were completed for client. Completed December, 2011. Emergency call-out for plumbing repairs at NAPI Fresh Pack Building. Repairs included drain line repairs, installation of new supply lines and vent installation in lavatory (Men’s and Women’s bathrooms). Completed December, 2011. ZCI removed and disposed of existing sliding glass door per scope of work. New header was installed, and frame-out to receive new exterior door. New Masonite siding and exterior trim-out, new door job extenders and mill set, and new 36” pre-hung exterior door were installed. Completed November, 2011. New frame-out and security window installed. Completed November, 2011. ZCI installed a window into an existing metal door at pump house. Completed November, 2011. The drain line was capped off, and new vent was installed. Completed November, 2011. Scope of project included removal and replacement of a house furnace for Unit #26. A new 150,000 BTU Rudd furnace was installed, duct work cleaned, plenum replaced and insulated, new thermostat and flexible gas line connection installed. Job completed November of 2011. ZCI furnished the labor to remove old carpet and pad, and furnished labor and materials to install new broadloom carpet and pad for one residence. Completed October, 2011. Project included construction of two interior walls, including 2 x 4 frame-out, installation of drywall with mudding, tape and texture, primer, and paint. New slider window, metal door and frame with door swipe, and baseboard installed. Change order included installation of new utility sink, pex tubing, and drain. Completed September, 2011. ZCI installed a new residential water heater, and two new ADA toilets. Completed September, 2011. Project entailed installation of two new 24’ wide by 18’ high Cornell Service doors, including steel tracks/guides, hardware installation for electric motor operation, and a 3-button system wall station. New header fabrication and installation of one vertical beam for frame-out adjustment was required. Completed September, 2011. Materials and labor were furnished by ZCI to paint the power plant government relations liaison office. Damaged acoustic ceiling tiles were removed and replaced with new tiles, and bent metal grid was repaired. Completed September, 2011. ZCI furnished and installed two new large evaporative coolers and two new A/C units at the power plant garage. The old evaporative coolers and A/C units were removed and disposed of properly. All units were started and tested for proper function. Completed September, 2011. At the 4/5 Building, ZCI furnished and installed a new ADA toilet and replaced VCT floor tiles in the women’s restroom. Completed August, 2011. 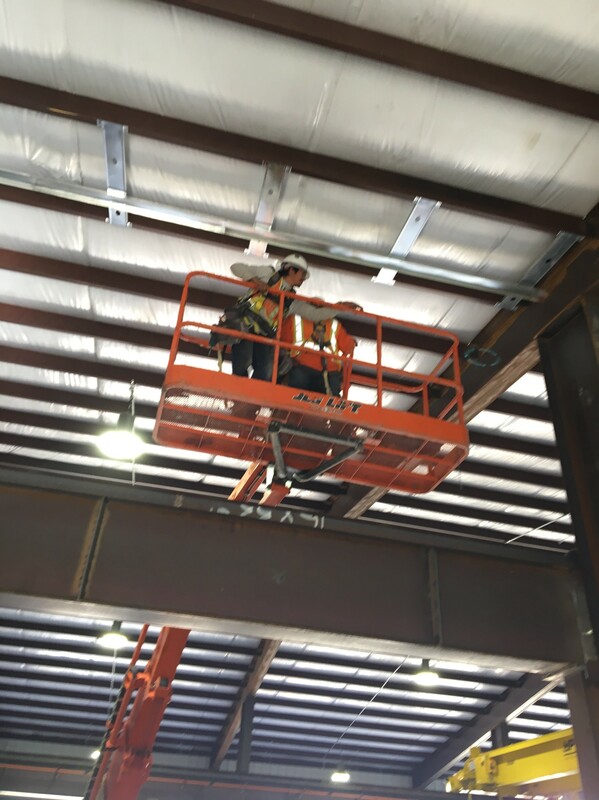 This project included installation of four 16’ x 16’commercial overhead doors, tracks, and electric trolley operator. Completed September, 2011. ZCI installed a new office door with metal frame-out for executive office. Completed August, 2011. 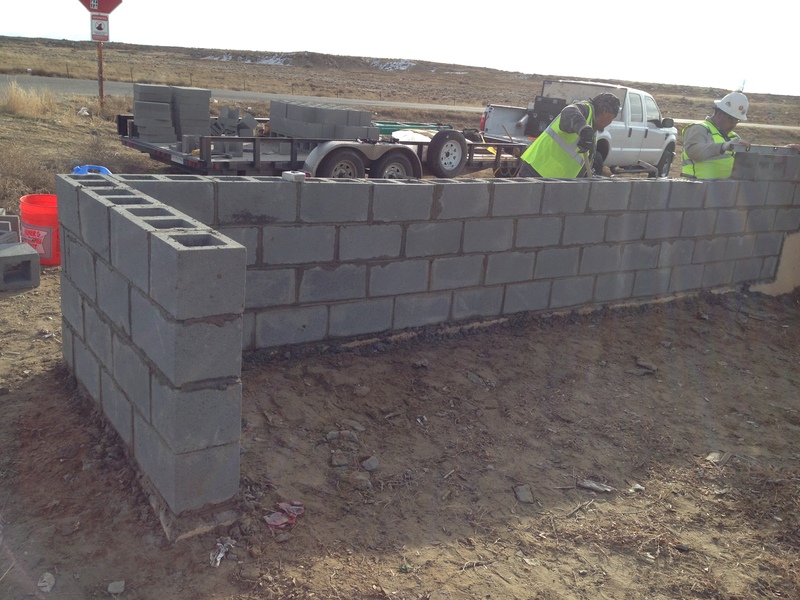 A concrete stem wall was installed measuring approximately 24’ x 10” x 36” in height to act as a splash guard at the Region 1 Farm Ops Fresh Pack building. Completed August, 2011. ZCI installed an 8’ x 5’ concrete slab for dumpster. Completed August, 2011. We furnished all labor and materials to inspect, clean, service, replace parts, and repair two Type 210 VO fan units for air handlers. Completed August, 2011. This project included repairs and hinge replacements for three hollow metal doors at the chapter house. Doors were re-secured to framework and adjusted to function properly. Completed August 2011. ZCI removed and replaced energy efficient vinyl windows. Job included new frame-out and header installation for one window, and installation of insulation, drywall repairs, taping, texturing, priming, and painting. Two offices received new paint and new cove base. Completed August, 2011. ZCI crew members re-leveled this mobile home. Completed August, 2011. ZCI provided labor and materials to install filters for the icemakers located in the kitchen and commons area. Completed August, 2011. Installation of one interior door sweep was completed, in addition to bay door electric motor repairs, installation of a door sweep at the bay door, two exterior door sweeps, and adjustment to vertical frame-out at the bay door. Completed August, 2011. Installed 3 vents in Lab with switches; installed exhaust fans, inspected for lower water flow and minor bathroom renovation work. All installations were complete with while Lab was in use. Completed July, 2011. All materials and labor were provided by ZCI to install new carpet and pad, new vinyl sheet flooring, and one pedestal sink in the garage apartment. Completed July, 2011. Original job scope included repairs to living room wall with removal and replacement of damaged drywall, taping, texturing, priming and painting new surface, and installing and painting new baseboards. Exterior wall repairs included removal of damaged stucco, realigning the wall framing at damaged site, replacing insulation, installing new stucco finish to match existing exterior finish. Change order work added to scope included floor tile demo, clean-up and disposal of old damaged floor tiles. Floor was prepped with removal of old glue, leveling off of chips and cracks on mono slab. New VCT 12” x 12” tiles installed in professional manner with new transitional strips installed as necessary. Job completed July of 2011. Inspection was completed for complaint of low water pressure. Water pump required repair, the ball valve replaced, and two new gauges were installed. Completed July, 2011. ZCI completed extensive inspection, cleaning, maintenance, and repair to eleven sky vents atop the 1-2-3 Turbine Enclosure. Supply air ducting for enclosure was tested for air leakage and repaired. Completed July 2011. NAPI hired ZCI crew to excavate trench for utility conduit installation. ZCI used backhoe and spotter to complete the project. Completed July, 2011. ZCI completed repairs to Mr. Benally’s swamp cooler and cooler stand. 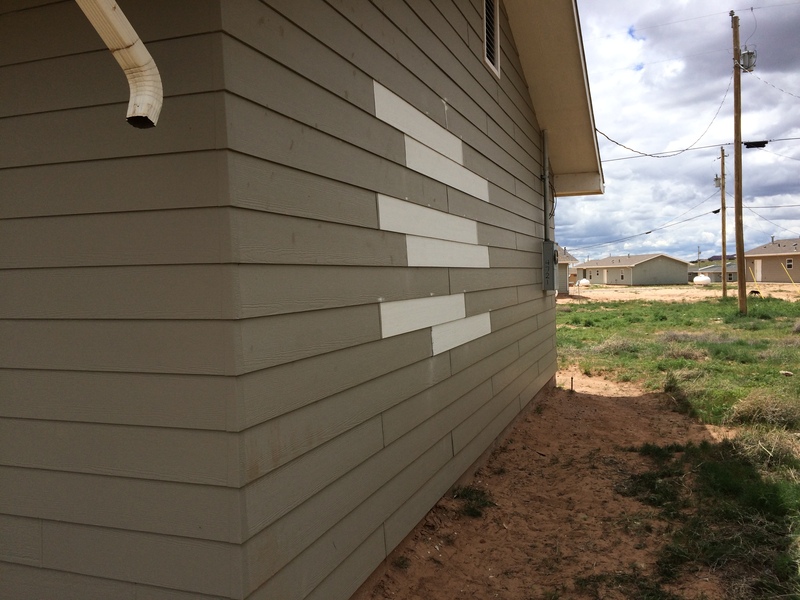 Crew also painted the exterior of the house per Mr. Benally’s request. Completed June, 2011. ZCI was hired to complete repairs to damaged drywall inside the Tucker Street apartment complex. Repairs were completed; drywall was taped, textured, primed, and received two coats of interior paint. Completed June, 2011. ZCI was responsible for purchase, delivery, and set-up of 10’ x 10’ pre-fabricated storage shed to provide temporary shelter and storage at the Region 2 Scale House. Additional site clearing, earth grubbing, and earth work was included in scope of work. Completed July of 2011. Emergency service call. Completed July, 2011. 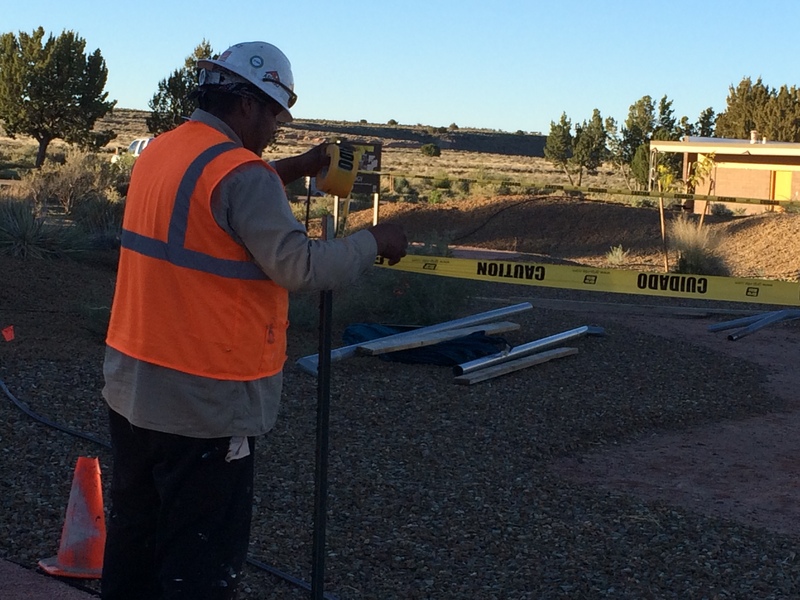 ZCI teamed with Eaton Corporation to conduct energy audits for residential housing units and commercial structures at multiple designated locations on the Navajo Reservation. The ZCI team completed audits for 75-plus residential units. Inspections were conducted for existing insulation, window types and sizes, structure framing, and heating/cooling and water heating units. Completed July, 2011. Malfunction located and repairs were completed to the south bay door. Completed July, 2011. ZCI provided materials and labor to install four commercial light pole concrete bases with embedded anchor bolts. Completed July, 2011. 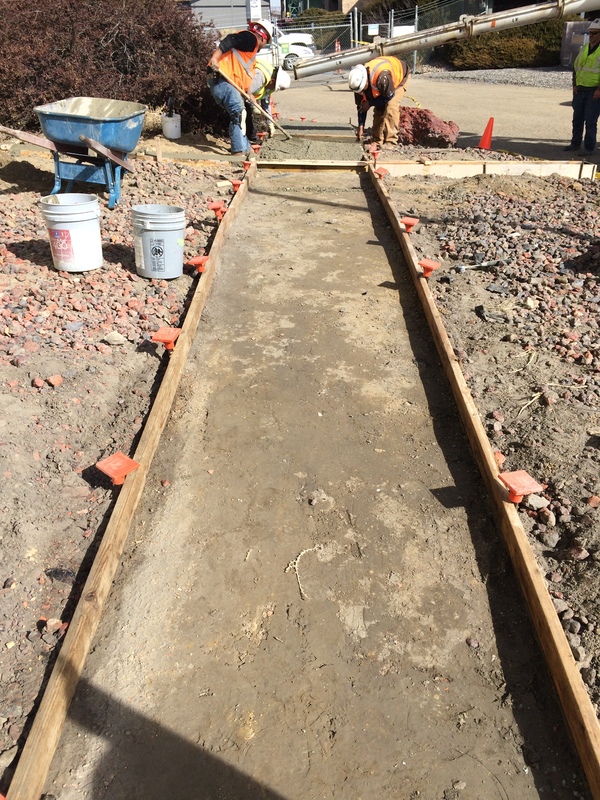 NAPI hired ZCI to install two concrete drive-up ramps at the Region 2 Scale House. The existing ramps had deteriorated and it was unsafe for commercial farm trucks to use them for access to the scale. 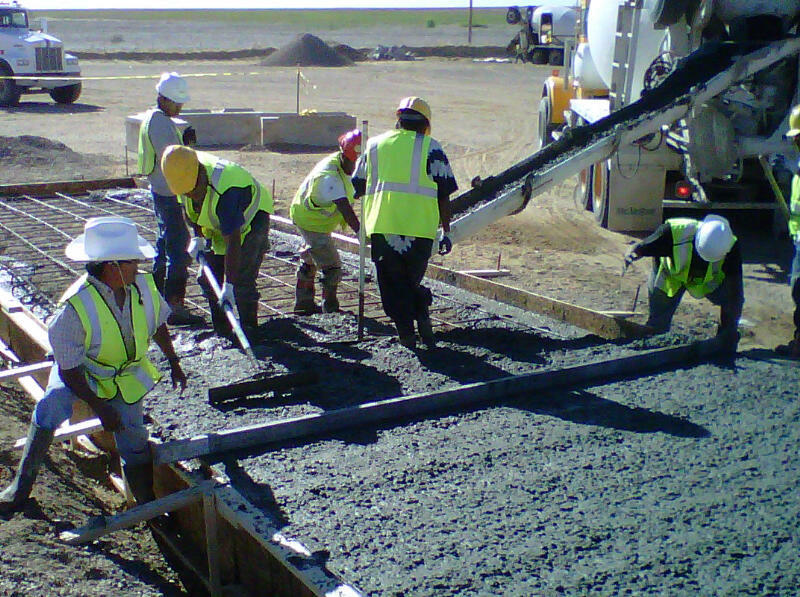 Our crew placed the forms, installed required metal reinforcement, and completed the slabs within a one week period. Completed June, 2011. New Pex piping was installed to supply potable water inside the main warehouse procurement offices. Additionally, ZCI hand excavated several locations in order to locate and reveal an underground valve. Completed June, 2011. ZCI provided all labor and materials to remove and replace a damaged 30’ tall steel I-beam located at the Region 2 Hay Barn. Completed July, 2011. Corroded roofing material was removed, along with obsolete, nonfunctioning HVAC units at the Region 1 shop. New propanel roofing material was installed, all obsolete connections capped off, and any roof penetrations were sealed and caulked. Completed July, 2011. All labor, materials, and equipment were furnished to repair vehicle damage to both the exterior and interior wall of a housing unit. After demolition of the damaged materials, ZCI crew reframed the damaged wall, installed new insulation, and sheetrock to the interior wall. Sheetrock was taped, textured, primed and painted to match adjacent interior walls; new baseboards were installed and painted. Damaged gang boxes, toggle switches, and electrical covers were replaced. New living room windows were installed after reframing the damaged area. The entryway received new tiles and a replacement for the damaged magnetic door weather strip. Completed April, 2011. ZCI designed and implemented a plan to install a rubber boot on the truck weigh scale to protect the scale from blowing sand and debris. The sand and debris was causing the scale calibration to malfunction and NAPI officials requested assistance to rectify this reoccurring problem. ZCI installed a flat bar along the perimeter of the scale, attached the rubber boot to the bar (similar to a table skirt), and arranged to have the scale recalibrated to accommodate the added weight of the boot. Our crew also constructed a propanel fence to further protect the scale from blowing sand and debris. Completed June, 2011. ZCI provided and installed twelve commercial grade exterior Lithonia lamps with photo cells. Completed June, 2011. ZCI performed extensive renovations on this four bedroom housing unit at the request of NHA. Work included moderate debris clean-up from previous vandalism; broken window removal and replacement, broken door removal and replacement, new door knobs, deadbolts, and locks installation, new bathroom mirror installation, new fiberglass shower/tub unit installed, new lighting fixtures and light bulbs installation, replace fire extinguisher and install replacement smoke alarms, install weather-stripping, door sweeps, drywall repairs, texturing, priming, interior paint, caulking, new exterior lights installed, exterior stucco repairs to damaged stucco, new exterior paint, complete turn-key house clean-up for occupancy. Completed June, 2011. All labor, materials, and equipment were provided to make interior and exterior repairs to the wall of a house damaged by a vehicle. Crew replaced damaged wall studs, bottom plate, sill, insulation, and remaining framework of wall; new interior drywall was installed at damage site, taped, textured, and repainted to match existing paint; exterior support wire was replaced and new stucco to match existing stucco was applied. ZCI replaced the damaged downspout with elbow and painted to match existing color. Completed May, 2011. 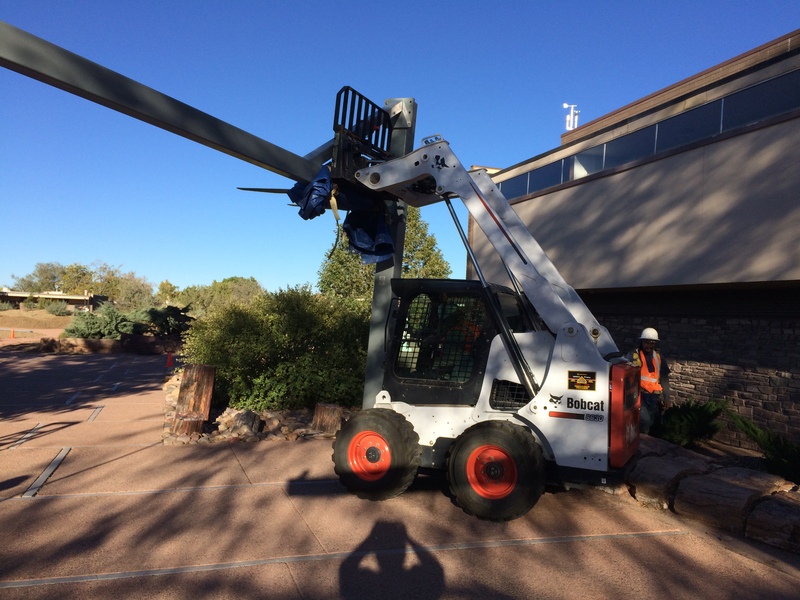 ZCI was hired to install new doors for various offices at the Jicarilla Administration Building. In addition, we installed several new windows, and relocated electrical and water lines to accommodate the installation. New drywall was installed, taped, textured, and painted for one office. Completed May, 2011. Installed duct work, New HVAC System, Wall Condensers, Cooling Units for I.T. Room (computer room). The purpose was to provide client with a controlled temperature environment for computer equipment protection in two locations in the Main Office Building. Completed May, 2011. This project entailed removal of fourteen heat pump units from the main office building, and installation of an 80,000 BTU heating and 3 ton cooling natural gas system, along with cooling and condensing coils, and adaptation of existing ductwork to marry with newly installed cooling units. ZCI supplied and installed fourteen new thermostats, installed new gas line from meter to all units, and was responsible for completing roof repairs to maintain the integrity of the existing roofing system. Completed May, 2011. Completed repairs to damaged roof due to heavy wind and rain. Roof tiles, roofing felt, and roof decking was removed and replaced with similar roofing tile. Because roofing was damaged the interior drywall was damaged as well. Interior drywall repairs were completed: removed and replaced drywall, insulation, sanding, texture matched, primed and painted. Completed April, 2011. Exterior repairs for stucco damage to home. Work included re-framing interior framework, installing insulation, wall sheathing, felt paper, chicken wire, installation of brown coat, and color coat. Texture matched, primed and painted. 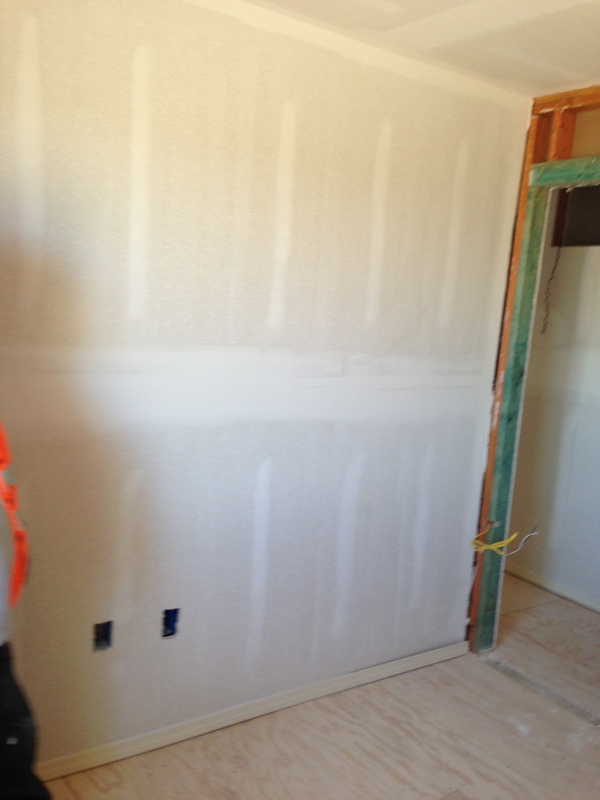 Interior drywall repairs were also completed: removed and replaced damaged drywall, installed tape. Completed April, 2011. This project included all labor, equipment, and materials necessary to install insulated replacement panels for existing 12’ x 24’ overhead doors. Completed March, 2011. ZCI installed new 12’ x 12’ insulated overhead door with track. Completed March, 2011. Repairs were completed to a burst water line. Completed March, 2011. ZCI completed repairs to existing boiler. Completed February, 2011. Troubleshot furnace problem, installed new thermostat, tested for proper function. February, 2011. ZCI installed gas conversion kits, and all heating units inspected for proper operation and start-up. February, 2011. ZCI completed installation of new Pex line, toilet, drinking fountain, electric heater and heat tap on the main line at the Central Pivot Building. Electrical work included installation of new 120 volt line, bathroom vent, and reinstallation of hanging light. Water damaged drywall, framing, baseboards removed, and new framing, drywall, and finish carpentry installed. New drywall mudded, taped and textured, primed, and painted. At north end of building, wall frame-out completed, cdx insulation and drywall installed, mudded, taped, textured, primed, painted, including finish trim-out. New interior door installed. Job included refurbishing two tabletops with plywood and new Formica top. Water damage to break-room was repaired with new framing, drywall, window and door repairs, and cove base installation. Completed January, 2011. Excavation to remove and replace gate valve to permit water to flow to OPS Building.Completed January, 2011. Plumbing repairs for in Maintenance building in men and women’s lavatories, installation of water filters in 22 locations throughout plant. Involved synchronization of water shut-offs at all locations, and keeping in compliance with corporate lock-out and tag-out procedures while building in use. Completed January, 2011. Performed drywall patch and repairs to APS Break Room. After drywall repairs, we sanded, textured, primed and painted (two coats). Work performed in a 48-hour time period to accommodate APS staff. Completed January, 2011. Job included all demolition work regarding: removal of flooring tile, flooring penetrations, and removal of acoustical ceiling. ZCI removed all carpet tile, scraped off old floor glue and removed cove base within room and removed all metal decking on floor surface and within the penetrations where concrete pour took place. All galvanized metal penetrations were removed and replaced with Vulcraft decking, floor leveling patch was used to patch up any dips, chips, and cracks in floor to prep to receive new VCT floor tile at all locations, including at reinforced areas and filled in penetration. ZCI, Inc. then installed decking with a qualified and certified welder. A heat blanket was used to protect wires below the floor surface. The floor decking was welded into place and the #4 grade 60 rebar was placed 8”o.c. per each penetration. 4000 PSI Concrete ¾” to ½” rock filled in the void along with an accelerant (1% or @% calcium). Concrete was poured in properly fabricated form, and finished to be level with existing floor surface. Floor leveler was used to bring continuity of old floor and new pour with a feather finish at 1/20” per 1’ of run, as per specs. ZCI, Inc. then removed all acoustical ceiling tile and replaced with new ceiling tile as per specs. Walls were prepped to receive one coat primer and two coats of paint. Walls were repaired where warranted. Once painting was completed, ZCI, Inc. installed cove base at perimeter of room. Completed January, 2011. New heater filters installed. Completed January, 2011. ZCI installed a new regulator in existing boiler system. This included balancing a two-zone system with newly installed regulator & control panel. Old boiler system had kept shutting down until new regulator was installed. Job included test runs for proper functioning of unit. Completed January, 2011. ZCI was hired to complete plumbing repairs to an existing bathroom urinal. Line trap and urinal heights were re-installed at correct heights for proper functioning. Crew also inspected heater malfunction, corrected pilot safety switch at heat exchanger, replaced transformer, installed White Rodgers gas valve heater, and ran new pilot tubing assembly to new valve. Completed January, 2011. Job included interior walls were prepped to receive one coat of primer and two coats of paint. Walls will have drywall repairs where it warrants. Once Paint is complete ZCI will install cove base at perimeter (includes cove base price and cove base adhesive). All paint work comes with masking labor and masking materials (paper, tape, plastic, room prep, and use of painters rig for a professional finish). Job included all demolition work regarding: removal of flooring tile, flooring penetrations, and removal of acoustical ceiling. ZCI removed all carpet tile, scrap off old floor glue and remove cove base with in room and to removed all metal decking on floor surface and within the penetrations where concrete pour is to take place. All galvanized metal penetrations were removed and replaced with Vulcraft decking, floor leveling patch was used to patch up any dips, chips, or cracks in floor to prep to receive new VCT Floor tile at all locations including at reinforced areas and filled in penetration. ZCI then installed decking with a qualified and certified welder. A heat blanket was used to protect wires below the floors surface. The floor decking was welded into place and the #4 grade 60 rebar will be place 8” o.c. per penetration. 4000 PSI Concrete ¾ “to ½” rock will fill in the void along with an accelerant (1% or 2% calcium). Concrete was poured in properly fabricated form and finished to be leveled off with existing floor surface. Floor leveler will be used to bring continuity of old floor and new pour with a feather finish at 1/20” per 1’ of run as per scope. ZCI then removed all acoustical ceiling tile and replace with new ceiling tile as per Specs. Walls were prepped to receive one coat primer and two coats of paint. Walls will have drywall repairs where it warrants. Once Paint is complete ZCI will install cove base at perimeter (includes cove base price and cove base adhesive). All paint work comes with masking labor and masking materials (paper, tape, plastic, room prep, and use of painters rig for a professional finish). ZCI furnish labor and materials repair one hanging heater at warehouse. Pilot safety switch at heat exchange was gounded out and repaired. Also propane line switched was affixed to gas line connection to meet code. Natural gas Regulator was installed to manufacturers specifications, completed start up and check testers. Repairs and trouble shoot labor and filters replacement to heating units. ZCI furnished Architectural and Engineering Services for CDC Tuba City Main Street Project. This includes: Development of image boards and community survey, field measurements and meetings, background and concepts, schematic plans, conceptual plans and reports, 2-D and 3-D renderings for project. ZCI furnish labor and materials to for the BLM Farmington Office (roof work for area 20,179 sq ft.)located at 1235 La Plata Highway. As per site visit ZCI recommend the scope to be as follows: Power washing roof surface with cleaning concentrate to insure proper adherence. ZCI will prep all rust areas as needed (two locations). For seam repairs/sealing, ZCI will install one layer of tie tex polyester fabric (mesh fabric) in Coatings of Prime base in all ponding areas, as well as to any splits, penetrations, voids, or vertical lap joints in roof surface. Repairs are to be three-coursed by applying prime base coatings at 1 ½ gallons per 100 sq. ft. in two passes at seams and water penetrations. 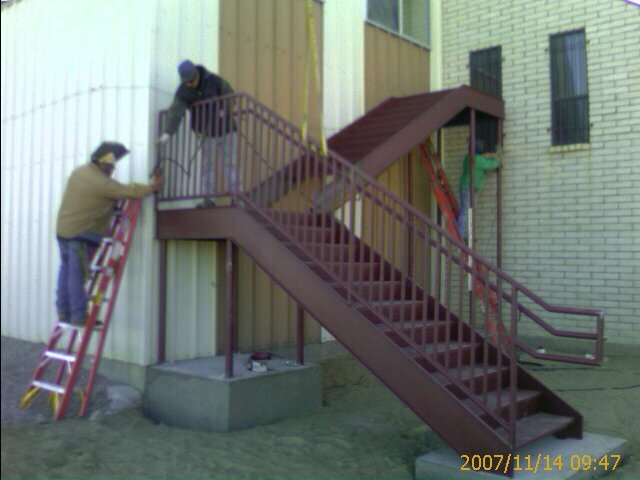 We used KM Coatings Products for this job. ZCI will Tighten or replace loose or missing screws then use AcryliCaulk as needed during repair work, particular over screws or fasteners, using the “Hershey Kiss” technique over fasteners. ZCI then appiled KM coating as a final coat at a rate of 1 gallon per 100 sq. ft. Then a second pass of final coat at 1 gallon per 100 sq. ft. in a perpendicular direction to previous coat. The total minimum of topcoat material shall be a minimum of 17 mils (DFT) at any location of the roof surface. ZCI furnished materials and labor to commons area offices. Job included interior wall frame out, drywall installation, mud, tape, prime and paint. Job included floor tile installation and cove base installation. This included installation labor and materials for two interior doors and two office windows. ZCI also provided the installation of interior electrical wiring with new receptacles and wall switches. ZCI performed repairs to heating coils at BLM office. In addition to repairs, ZCI trouble shot of top heating/cooling units and operations testing for HVAC. ZCI furnish labor and materials repair to two HVAC units at the Chapter House. This included motor replacements of two units. 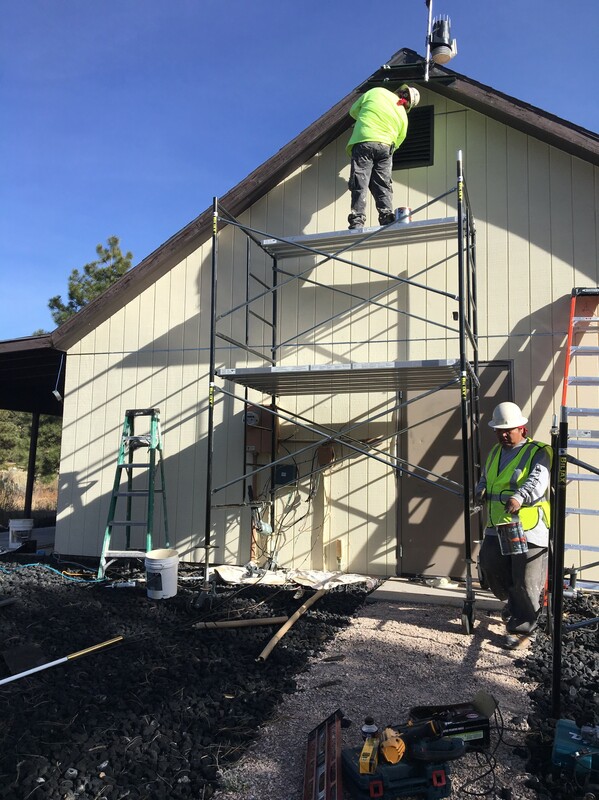 ZCI assisted in the design layout to install solar upgrades for the Southern Ute Indian Tribal-Recreation Center at Ignacio, Co.
ZCI furnish labor and materials repair for stucco repair job for NHA kitchen unit at Window Rock, AZ. This included stud repairs, mend weep screed, mesh installation, replace stucco, drywall repair, tape, texture, base boards replacement, prime and paint at front of apartment. Job included framing replacement, window installation, replaced insulation, remove and replacement of old plumbing and electrical wiring. Remove and replace base cabinets, upper cabinets, base boards, counter tops, trim and hardware. Drywall removal and replacement, including mud, tape, texture, sanding, prime and two coat paint application. Included removal and replacement of floor tile in kitchen and dining area. All copper, ABS drains for kitchen faucet, sink were also installed. Job finished with site clean up and caulking. 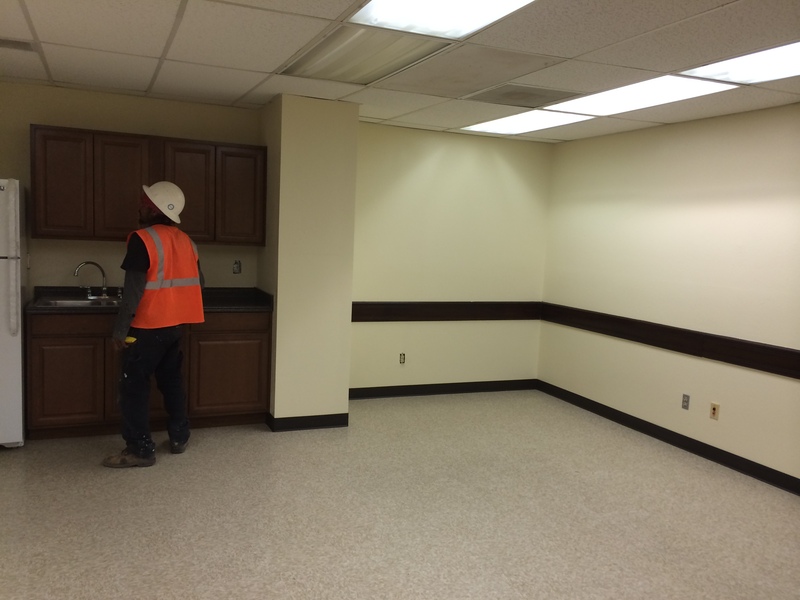 ZCI furnish labor and materials repair for existing plumbing in the men and women’s restrooms. Included toilet removals and replacements, rodding, clearing of sewer lines, and installed new clean out caps. Bathrooms were newly painted. ZCI furnished materials and framing labor to enclose office from doorway passage. Job included wall prep (drywall patch), masking, one coat of primer application and two coat paint finish. ZCI furnish labor and materials repair for stucco repair job for NHA unit#19. This included repairs to exterior wall at carport area, inspect and repair load bearing beam, stud repairs, mend weep screed, mesh installation, replace stucco, drywall repair, tape, texture, base boards replacement, prime and paint. ZCI furnish labor and materials repair for stucco repair job for NHA unit. This included stud repairs, mend weep screed, mesh installation, replace stucco, drywall repair, tape, texture, base boards replacement, prime and paint. ZCI furnished materials and labor to complete office paint job. Job included wall prep (drywall patch), masking, one coat primer application and two coats of paint for professional finish. 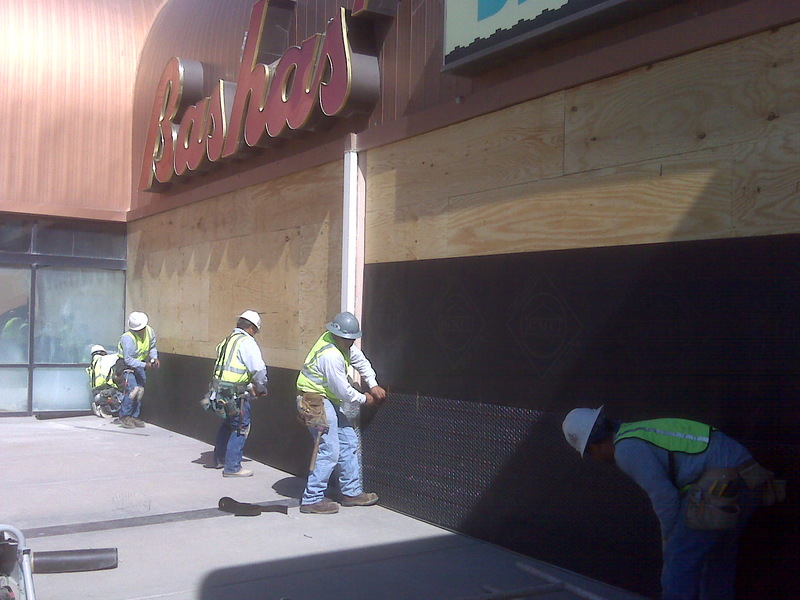 ZCI furnished framing layout, framing installation and wall sheathing to prep for new stucco at Bashas Store Front at Shiprock, NM. Job included all stucco prep, on site mix of product, brown coat trowel application and STO- color coat application and finish. Completed September of 2010 NAPI-Region 2 Scale House-Cabinets Farmington, NM ZCI furnish labor and materials base and upper cabinets as well as counter tops for NAPI Scale House. This job included installation of cabinets and all associated trim and hardware. ZCI provided materials and labor to replace all filters at HVAC roof top 11 units (filters will be fiberglass), ZCI will also replace bad thermostats, clean condensers and evaporative coils in all units, perform mega-ohm test on all compressors. ZCI furnish labor and materials to re-install Septic Tank Wash out due to heavy flood rains. Job included the import and export of fill material, use of backhoe and heavy equipment to complete job. 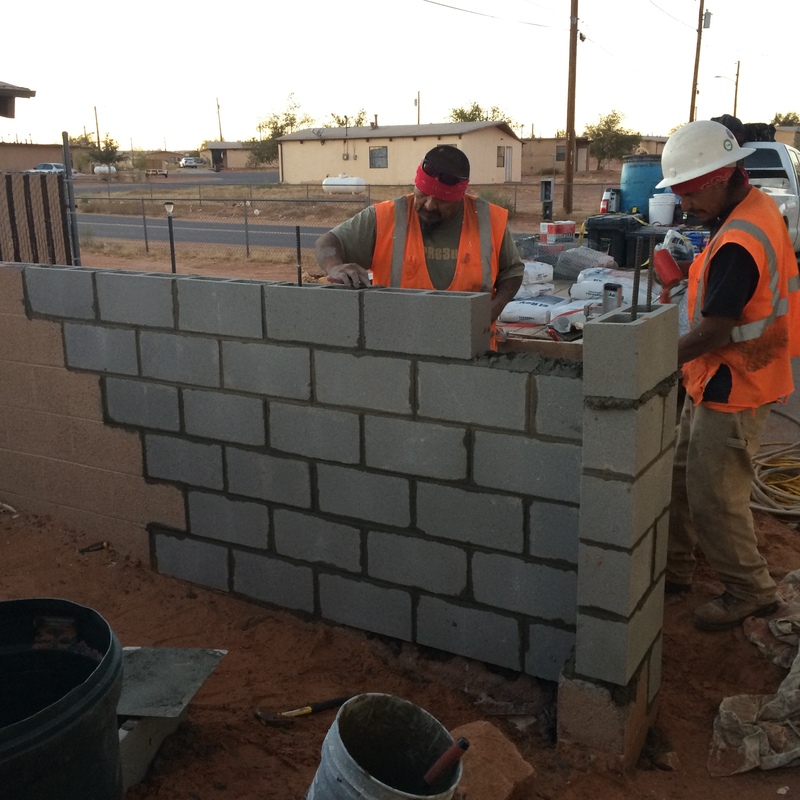 ZCI furnish labor and materials to remove and install stucco for unit 18 housing units at Lower Greasewood, Arizona. 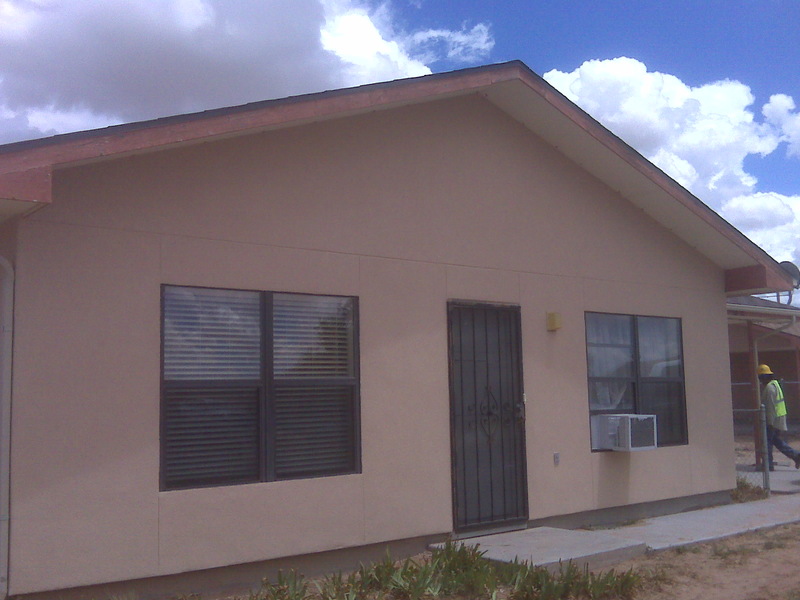 Each home received a brown coat/ leveling coat, and a STO-Stucco finish coat at Lower Greasewood, Arizona. Job included all scraping, taping and masking, mixing labor, leveler, primer, all stucco materials and labor for above said location. Mobilization, daily jobsite cleanup were performed to complete job. Shop break room, bathroom, and managers office renovation were job locations. Scope included wall frame up, drywall installation, mud, texture, sand, prime and paint, base board installation, break room paint job, interior wall repairs (reframe), floor tile installation, restroom upgrades (men and woman’s Bathroom). ZCI furnished framing layout, framing installation and wall sheathing to prep for new stucco at store front in Kayenta, AZ. Job included all stucco prep, on site mix of product, brown coat trowel application and STO-color coat application and finish. Power wash excess debris from 27 skylights located at Region 2 Shop Warehouse Building. ZCI proposes to used man operated lift, power washer with hose and associated fittings to complete job. Skylight Cleaning will occur at exterior at all 27 sky light locations. Pro-Panel removal and replace damaged exterior sheet metal 18’-20’panel lengths to the cover an approximate area of 3,428 sq ft. exterior of building. This job included roofing repairs and drywall repairs and various repairs over 12 trouble spot locations at interior and exterior. Included roofing patch work, interior removal and replacement of water damaged drywall, mud, texture, prim and paint. This job has various elements-Acoustical ceiling tile repairs, electrical upgrades-fixtures, window repairs, framing, propanel installation, drywall and paint work. ZCI performed renovation work for various NAPI sites. ZCI furnished Layout and design for electrical distribution and service including service calculations, short circuit calculations, and coordination with local electrical utility. Production of electrical construction drawings in "B" size format (11"x14") with specifications as necessary to be included on the drawings. ZCI furnished provided renovation work for IT Office Room, Valdez Office, and minor electrical work at NAPI Main Office. Renovation: included demo work, drywall removal and replacement, mud and texture, primer and paint, ceiling tile replacement, installation of new windows, window installation, carpet removal and new wall to wall carpet installation. Scope included the electrical receptacle relocations for to accommodate more amps and convenient receptacle locations. ZCI did all excavation and dirt work for electrician at site. Backhoe with operator and spotter were used the dig and import of fill used to complete job. This scope also included compaction of moved earth. ZCI did all excavation and dirt work selected for community dirt pongs. Job included site survey, uprooting trees, debris removal, export of fill, and site grading. Backhoe with operator and spotter were used at dig to complete job. This scope also included compaction of moved earth and mobilization. ZCI furnished labor and vent (and all associated materials for an updraft exhaust fan serving to collect fumes from commercial trucks (14’-20’ long by 2’ wide) at roof of potato warehouse, exhaust hood tied into exhaust fan drop. Job included all electrical work necessary to run a one horse power unit. This job was to furnish labor and materials for the following: calibrate existing air switch motor on boiler, clean flue of excess debris, clean and re-install all 14 strainers at various locates in ceiling, clean pipe of existing build up to ensure proper water flow, and to install one valve motor. Test run work until unit functions properly. Apartment door repairs job. ZCI performs most maintenance for O’Donnell Properties. Scope included trouble shooting this project as there were no as-builts or site drawings from owner. ZCI provide backhoe along with backhoe operator and spotter to locate line breakage. The two inch and one and a half inch lines were exposed and repaired along with tee. One dormant water line was stopped up and a new water heater was installed, dirt work was performed to bury lines to proper depth and to assist with flow of standing water. Scope was flange valve replacement at four locations at NAPI Region 1. ZCI excavated and replace damaged valves. Trouble shooting this project was necessary as there were no as-builts or site drawings. ZCI provided backhoe along with backhoe operator and spotter. The four inch or six inch line will be exposed and flange valves were replaced. 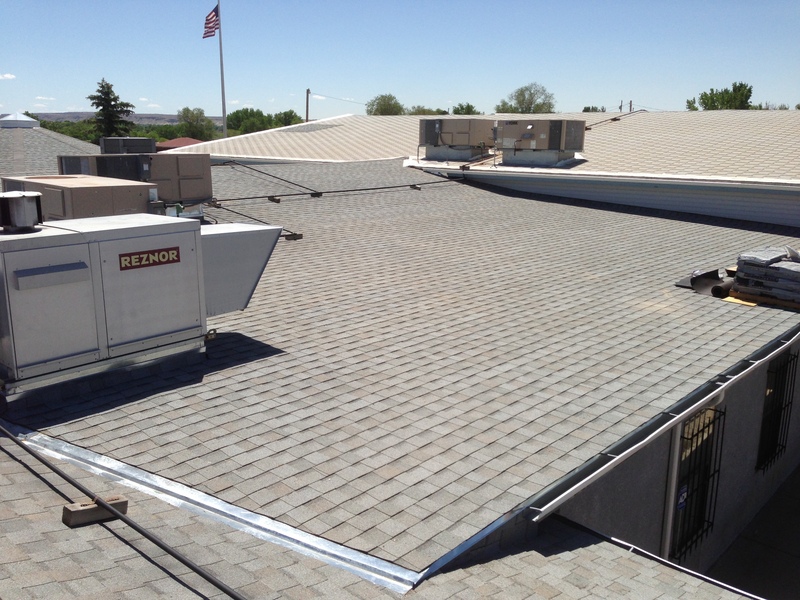 ZCI removed and replaced a commercial grade galvanized roofing system. This included removal, disposal and installation of like or similar galvanized panel with ridge cap and all associated screws and sealant at seams. ZCI also removed all damaged drywall and insulation at ceiling location. ZCI sold playground equipment to the chapter’s pre-school program. The Challengers play set was for ages 5-10 and included freight delivery that was packaged. ZCI repaired chapter house auditorium lighting approximately 18’ high. Scope included trouble shooting the electrical wiring and replacing the florescent lighting. ZCI installed all windows for seven units (three -4 bedrooms and four – 2 bedrooms) to weatherize homes for current residents. All exterior doors removed and replaced with pre-hung fire rated doors. All units were stucco and there were also stucco repairs involved at newly installed windows and doors. Job included drywall repairs, stucco repairs, and paint touch up. All new cabinetry and counter tops installed for kitchen and laundry room. This included installation, caulking and trim work. November to December of 2009. The Center was closed due to structural and plumbing issues. ZCI was hired, after a competitive bidding process, to determine what should be done with the structure. The ZCI team, made up of our licensed architect, structural and geotechnical engineers, made field inspections of the Senior Citizens Center, and also performed a soils investigation and lab tests of the subsurface conditions at the site. While there were obvious cracks in walls, floors and sidewalks of the building, it was determined that these issues were in fact not due to soils subsidence, but rather were more cosmetic in nature, and that with repairs and monitoring, the structure could be put back into beneficial use. A report with recommended remedial actions and cost estimate was produced for the Navajo Nations OEH (Office of Environmental Health). ZCI was hired, after a competitive bidding process, to evaluate the existing Chapter House to determine it's feasibility for long term use. Our team, made up of our licensed architect, structural and geotechnical engineers, made field inspections of the House, performed a soils investigation, back ground community survey, topographic survey, Resource Assessment (land, etc), traffic access, grading drainage, regulatory code analysis and infrastructure availability. Due to it's advanced age [over 50 years], it was determined that the existing structure had outlived its useful life as a chapter house, and that a new structure should be developed. ZCI developed a master plan for the entire Sanostee Chapter campus, along with a schematic design for a green, sustainable new chapter house, complete with detailed cost estimate and full color architect's rendering. ZCI design built 1,800 sq. ft. building, which was responsible for all phases, such as: Concrete foundation work, rebar installation, concrete forming and finish. Completed all framework on building, installing trusses, sheathing, decking, vapor barrio, window and door frame outs, ordering and installation of windows, doors, and bay door, installed all phases of plumbing, HVAC, and electrical work. ZCI installed drywall, did mud/texture, prime & paint, installation of acoustical ceiling, flooring materials, exterior aprons, sidewalks, concrete aprons, all cabinetry and trim-out. 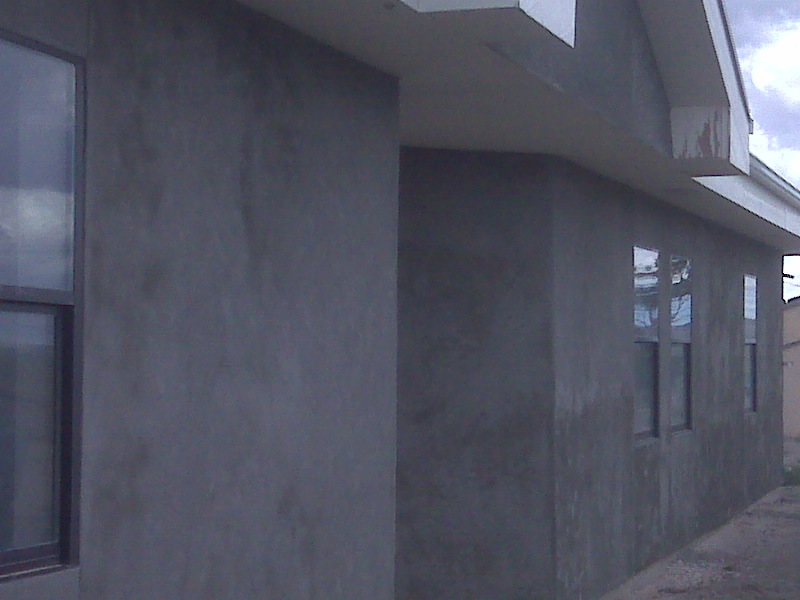 ZCI also designed and completed exterior landscaping and installation of gutters. ZCI removed old floor tile and replace with new VCT tile to the entire building; 10 offices, two bathrooms, one break room, one reception area and the conference room. The entire building was operational when tile was removed and installed. ZCI installed commercial heavy metal gauge fencing for the Sky Ute Lodge and Casio for the hotel guest playground area. Scope included: delivery, installation, concrete, post holes, gate and all associated accessories. ZCI excavated approximately 580 l.f. of sewer line. Approximately 580 L.F. of Line was replaced/repaired with proper drainage, installed two pre-cast man holes with cover at two locations for future clean out. Job consisted of trouble shooting, excavation and dirt work, compaction after job was completed, grading, and the import of base at manhole locates. ZCI provided backhoe and operator with 30 years experience. 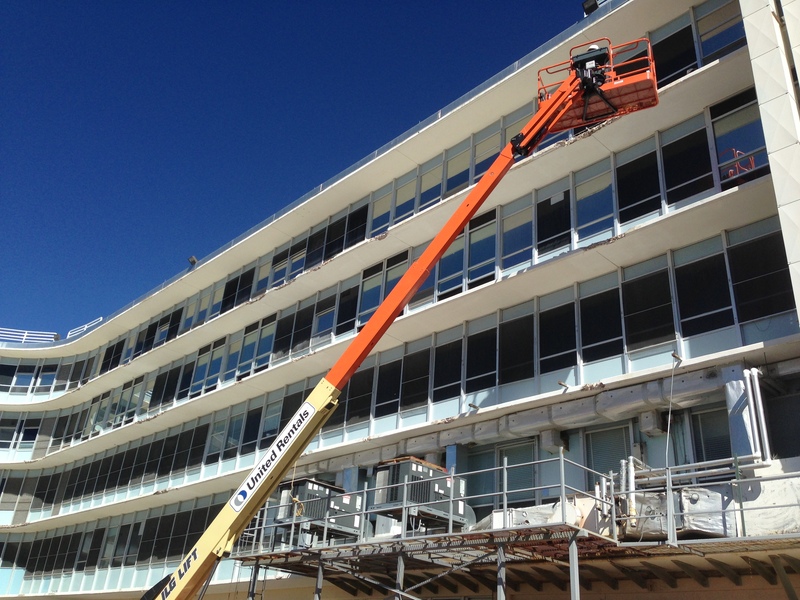 ZCI performed all interior industrial clean out and exterior demolition work and repairs. New exterior siding installed (primed and painted), new insulation installed at ceiling, and re-adjusted door (repainted with two coats of DTM), one coat primer and two coat industrial paint application at exterior only. ZCI performed all interior and exterior demolition work. New fascia and roof repairs (roof re-decking and asphalt shingles were completed), old swamp cooler removed and replaced with a frigid air unit. All plumbing upgraded (toilets, sinks, mirrors, soap dispensers, toilet dispensers and paper towel dispensers, the interior that wall damaged was repaired, textured and sanded down, new window installed at east side of the building, water lines repaired at interior wall, new exterior siding installed, new flooring installed throughout building), new light fixtures, new doors installed (along with hinges, locks and hardware), one coat primer and two coat paint application at interior and exterior. ZCI demolition of old doors, and windows, crew scraped and cleaned out interior. ZCI also demo scrape down the soffits to ready for paint. Concrete floor was resurfaced and ZCI did apply a concrete sealant to floor. Exterior Siding: Installed pro-panel 26 gauge to exterior siding. ZCI also installed pro-panel roofing materials over announcer’s box area. Interior: ZCI cleaned ceiling and walls and to apply masonry paint with similar concrete block colors to wall and ceiling. A new window was installed with Low-E glass and tempered. ZCI will also install two new steel metal doors for the east and west entries. Scope included removal/replacement of old doors, demo old wall paneling in 3 rooms, patch up damaged drywall holes, old lead window blinds, and removal of laminate at desk. ZCI also removed and replaced old floor tile in office building. New flooring materials installed included similar or like VCT tile installation in SW office room. Scope included VCT tile and floor adhesive and all trowel labor. Exterior Repairs: ZCI also demo old decayed exterior masonite siding and scrape down flaked paint at soffits then Installed masonite siding, including z flashing, reframed old gabled pitch to prep for siding installation. Scope included exterior trim work around widows and at four corners of building. 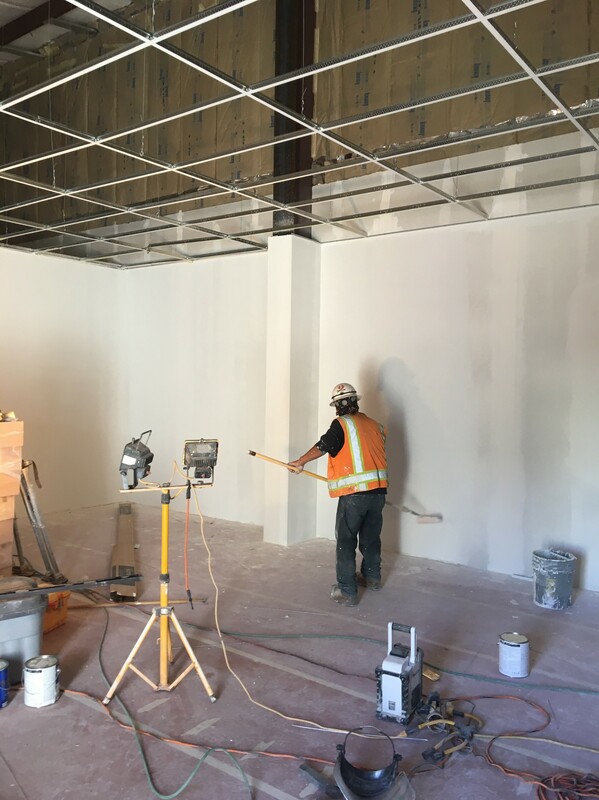 Interior Repairs included: patching up of all nail holes, nail pop outs, ceiling, and any wall surface areas that had wall damage with gypsum board type X. ZCI textured wall area where panels were removed. All Interior and Exterior paint and primer: one coat primer application and a two coat paint application was applied with painters rig at interior and exterior of office(included masking labor and masking materials, tape, paper and drop cloths). Doors: included installation of pre-hung doors at exterior included all door hardware, hinges, casing, shims, door knobs (keyed if desired) and labor to install. 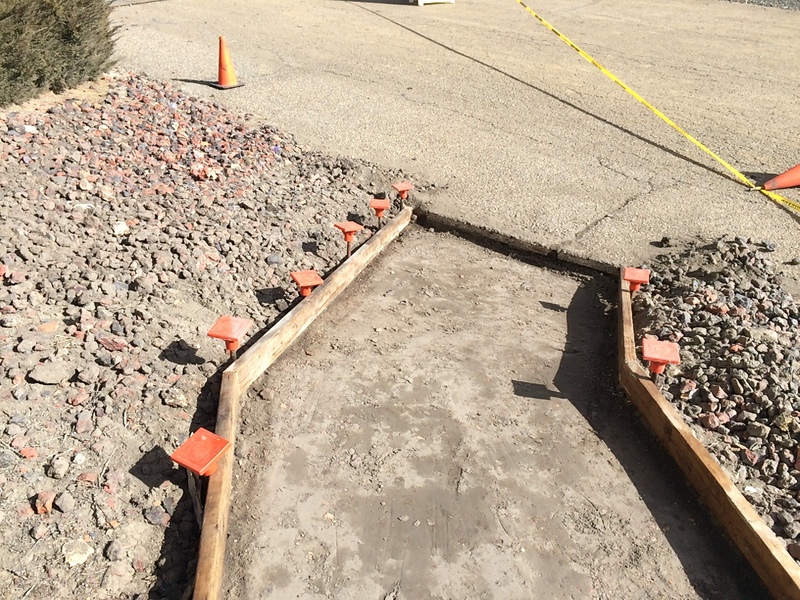 Concrete: we removed old gravel and from pit and place gravel at perimeter of office building. The ground was prepped and compacted for concrete slab. Scope included mobilization, excavation for ground level concrete layout, concrete, remesh placed for reinforcement and all form work, compaction of dirt and concrete finishing. ZCI installed approximately 120 l.f. of sewer line (approximately 6 joints) at shop location of Region 2. ZCI supplied labor (operator and spotter), materials and equipment (backhoe) to complete job. ZCI also cleaned out the septic tank and ran water tests to ensure proper drainage. ZCI supplied new air conditioning unit and installed new electrical line to accommodate newly installed cooling system. ZCI supplied materials and labor to complete this job. ZCI furnished labor, materials and equipment to clean out sewer drain and repair line break. This included use of ZCI backhoe and operator. This was emergency repair work. ZCI removed old tile and replaced new carpeting (wall to wall). Scope included demo, floor prep, carpet installation and base boards trim out. 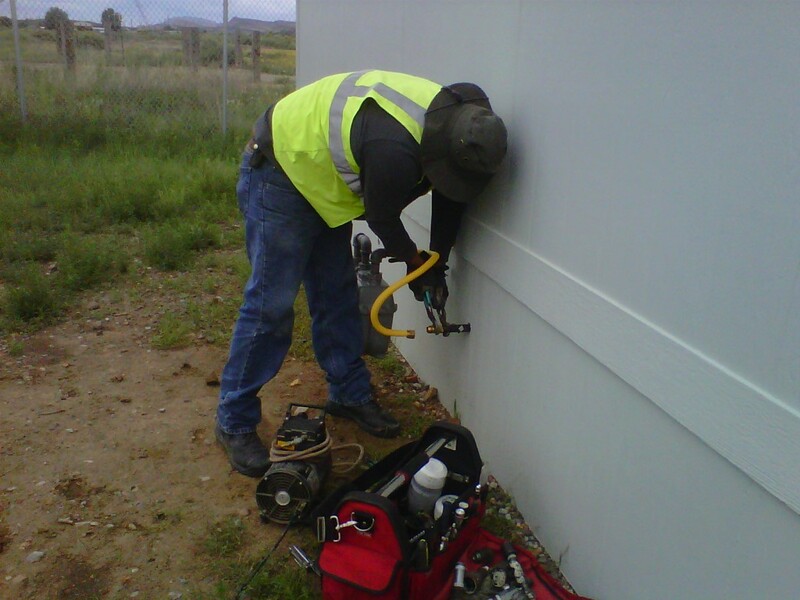 Emergency plumbing repairs for satellite office located on Navajo Land. ZCI furnish labor and materials to install new carpeting in front conference area. Approximately 10,000 sq. ft. of wall space primed and painted (including tape, texture, and masking). New commercial grade carpet installed at interior. This job is primarily renovation work. ZCI Renovated Region One scale house conference room, entry rooms, and all hallways. Removed old panels, replaced missing electrical receptacles, correct/adjusted windows Interior and exterior doors (steel metal doors). This included plumbing upgrades on water lines and plumbing accessories as well as plumbing finishes. Work completed with paint application with commercial rig. ZCI installed a new commercial grade ice machine in the employee break room for Farm Operations Department. ZCI furnish labor and materials repair for existing plumbing in the men and women’s restrooms and to upgrade existing: toilets, urinals, and fixtures. Bathrooms were newly painted. ZCI installed two new interior walls to enclose an existing hall way for addition office storage space. Work consisted of framing labor, carpet tile installation; new door installation (stained and gloss application to match existing doors). Scope included drywall installation, mud, texture, sanding, paint and finish. The design/layout for new double sided road signs for Region two area. Sign design work, sign fabrication, and installation of signs. ZCI furnish labor and materials to re-pipe the shop building water lines for bathrooms. New pex water line installed at employee locker room/bathroom locates (men and women), utility closet and water fountain installation. Exterior water spigots were also repaired and upgraded. Scope included floor tile installation and partition dividers. ZCI also removed all mold damaged building materials. Job included paint work for upgraded plumbing work. ZCI furnish labor and materials to remove and replace carpet in a commercial office space. Installed stationary window in new office space, including additional framework (headers) and re-routing electrical lines, trim work, and paint throughout. Office was operational and ZCI worked around existing operations so client could remain operational. ZCI furnish labor and materials install a pony wall at scale office location at Farm Operations Office, along with office door, and bolt down new safe. NAPI-Region 1-Scale House Plumbing Farmington, NM ZCI furnish labor and materials to re-pipe the shop building water lines for bathrooms. A 1 ¾” pex water line installed along with a new water heater with an expansion tank. Isolation valves installed to a low for future tie ins. Unused lines were stopped off. New 220 bolt line installed to accommodate new water heater. Molded and water damaged walls replaced and primed and painted. All applicable drywall work and sanding and texture applied. ZCI demo, removal of one toilets, one wall mounted urinals, wall dividers, cove base on the south end of the wall, removal of sinks. Demo damaged drywall from floor on up, removal of any rotted framework and insulation (if applicable). 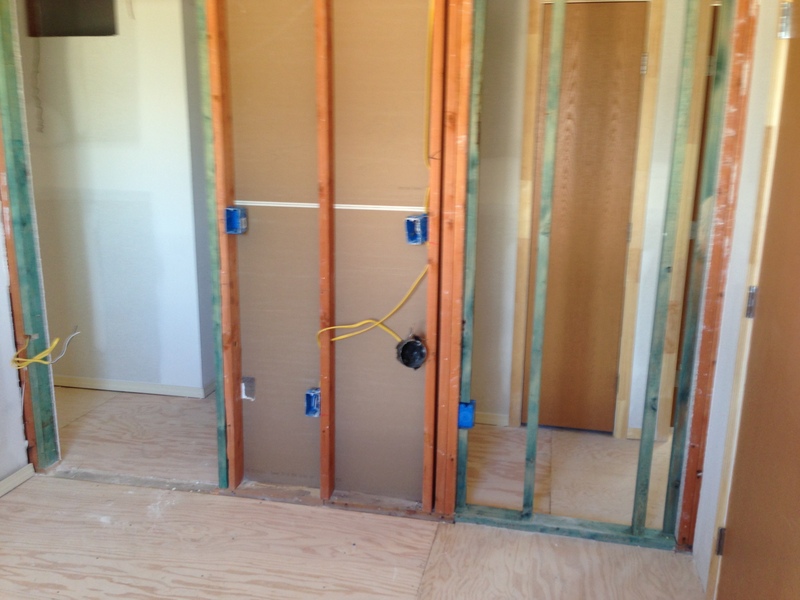 ZCI installed water board (waterproof drywall) in lieu of drywall or green board. ZCI installed new seated toilet and wall mount urinal (with fixtures), replace sinks along with new fixtures, install a wall mounted mirror, new light fixture, regular toilet paper dispenser, fabricate a partition divider with a new partition door, install a new soap dispenser and a paper towel dispenser. Scope included any wall repairs done from corner to corner with commercial grade semi-gloss paint. Replaced any damaged tiles matching as best as possible to pattern and color. Scope included all applicable caulking, labor and materials provided to replace damage floor tiles, removal of glue and apply a concrete stain or to replace with similar tile (match as close as possible), install a new operational light fixture/fan fixture, installed a new freestanding utility sink in place of obsolete utility sink. New sink had fixtures and fittings to make operational. New water fountain will be a new freestanding drinking fountain or a wall mounted fountain. Basic clean out and waste disposal of site is also included in price. ZCI furnish labor and materials for interior renovation employee locker room, Plumbing upgrade to pex system, remove and replace old flooring, upgrade plumbing fixtures (toilets, urinals and faucets), Removed and replace water damaged drywall, including mud/tape and texture, sanding, masking and tear down, primer and two coat paint application with commercial spray rig, install new flooring and thresholds as well as base boards. ZCI furnish all labor for basin erection for new bio-fuels lagoon, job also extended to industrial paint contract for neighboring plant (primer, paint and caulking), cove base installation and stain on concrete floor. 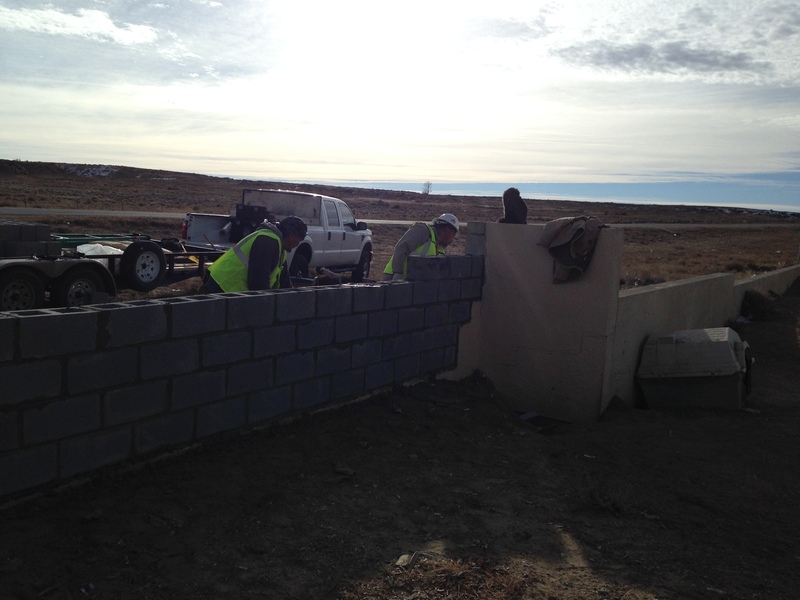 ZCI provided skilled labor (Carpenter, Operators, Laborers, CDL Driver) for a four man crew to assist GC at the jobsite. ZCI furnish labor and materials for interior renovation, remove and replace old carpet, remove and replace old tile, Bath upgrades, and single coat primer application and two coat semi-gloss paint application, trim and base board finish. Renovation and upgrades for rental units , Installation of interior walls, interior carpeting, floor tile, bathroom tile, fur out for closets, installation of interior doors, exterior doors, bathroom renovations, new water lines and plumbing upgrades (toilets, sink, tubs and fixtures), electrical wiring, interior and exterior paint . Cabinet installation, window installation, installing fire rated walls, installing new fixtures, exterior decking slab landing, and exterior siding installation and some light stucco. Installation of pro-panel 26 ga roofing material for Tanis Residence. Installation of updated roof jacks and gutters. Excavation, installation, of water lines (sewer/water clean outs), fittings placement, water meters installed, concrete collars forming, concrete finish, fine grading, water meters placed to proper level. Insulation Upgrade (11 Units) for R-30 Blown Fiberglass insulation 11"-12" deep with white fiberglass, insulation to meet the R-30 factor. Bathroom Upgrades for three units included removal and replacement of tile flooring, new base boards, new tub-surround, removal of decayed and water damaged walls, the installation of new windows and removal and replacement of sinks and toilets. Mold issues were also addressed by professional cleaning or wall removal and replacement. Prime and paint throughout. Project included some light stucco and some exterior paint work. Weatherization Project included the installation of 40-storm doors at Sunset Subdivision. ZCI remove old doors and installed new 3' wide doors and 2'8" wide doors (half screened storm doors) with new hardware (hinges, door handles and locks), caulking and finish. Quote was for labor only (client provided storm doors and hardware). Project was a weatherization project for a 20 unit housing subdivision. Landscaping Project included design and engineering and construction layout for approx 20,000 sq. ft. of recreation park space. 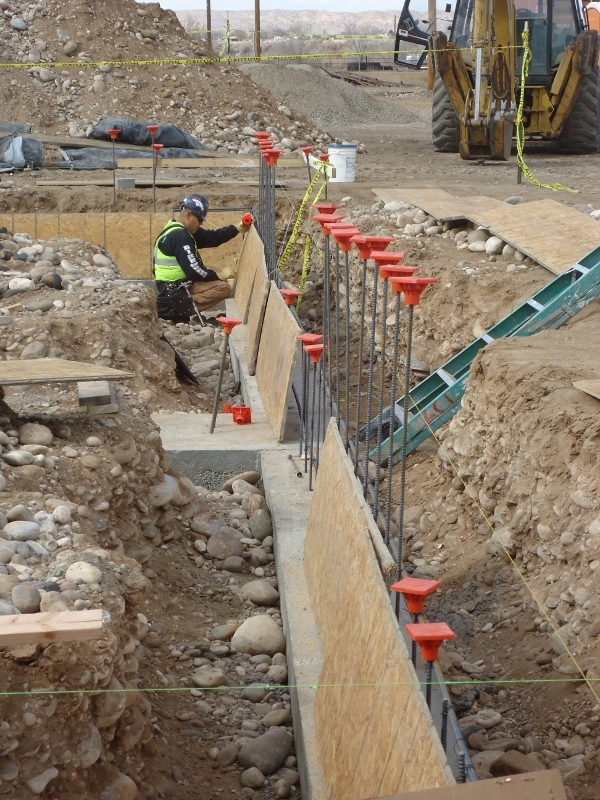 Work was performed for the Southern Ute Indian Tribe, Project timeline May-August 2008. Project included playground installation for appropriate for ages 5 to 12 years, installation of a basketball court, and installation of two barbeque picnic areas for residential enjoyment and community upgrades. Approx. 3,062 sq ft of concrete work performed (including demo, and installation of picnic area slabs, basketball court, sidewalk demo and installation). Concrete work included grading, forming, rebar placement, concrete pour and finish work. Site was cleared for crusher fines, gravel or 3/4" rock, alternate color landscape rock and boulder installation (4-6 tons a piece). All above items were placed over landscapers weed fabric and included the installation, shakedown, staking of trees for shade. Also included installation of park benches, picnic tables and trash receptacles. 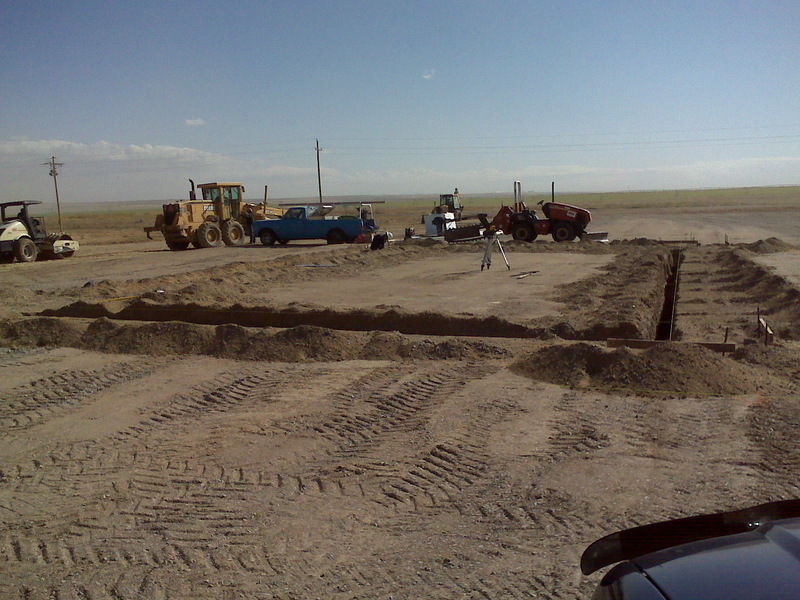 Plumbing Upgrades for Fresh Onion Pack Navajo Agriculture Products Industry (NAPI) Farmington, NM This project was for the re-piping of the water lines for the Men and Women's locker room and bathroom/showers facility at Region 1 Onion Fresh Pack Building. ZCI excavated/trenched site to tie in a new water line at East location of building. The new waterline connection made to make bathrooms and showers workable, all water lines were replaced with apex-pipe system. All toilets and urinals were removed and replace along with new flush valves for each unit. Entrance break room also had plumbing upgrades, new wash basins installed, a new water cooler, etc. Both locker rooms were repainted with drywall patch and repairs along with new interior trim work. This proposal is for a concrete containment slab to be used a Fueling Station Slab. Project consisted of site clearing, leveling and layout. Project included formwork, rebar package, reinforcement bar installation, concrete pour and finish with a containment rim for fuel collection. Project included roofing repair for pro-panel 26 ga roofing system. Job also included inspection of over 4,800 sq. ft. of roofing and winter protection assurance, interior ceiling repairs, replacement of sewer and water lines at second story, and line pressure testing. Repairs included waterline (cap off) in three locations, install urinals, toilets, a variety of plumbing fixtures men's restroom and locker room areas, installed copper tees for drain at AC swamp units at exterior, replace bearings and shafts in two units, water pressure testing and installation of Flexible hose. Reinstalled acoustical tile and replace damaged drywall, primed, painted and finish. 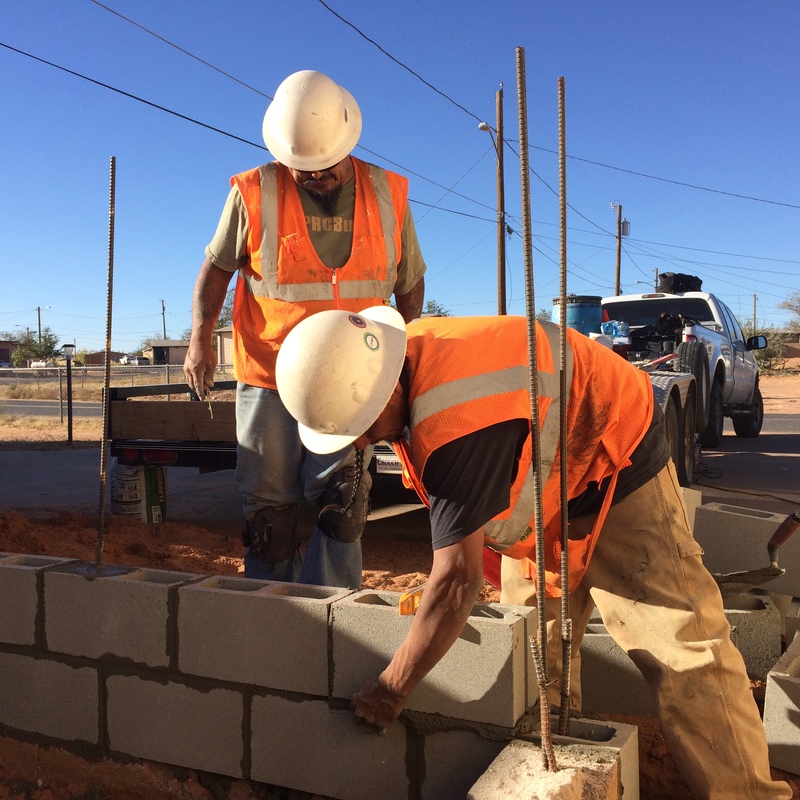 Project involved bringing the Walter Collins Building up to code as per building and safety standards enforced by the Navajo Nation and OSHA. ZCI provided labor, supplies, materials, and equipment for removal and disposal of mouse droppings (above the drop ceiling on the second floor and in the corners of all the rooms on the first floor and the gymnasium (approx 1771 sq. ft.), job included the removal of excessive vegetation growth, soil sterilization, clearing and zeroscaping approx 5,200 sq. ft. (perimeter of building), the fabrication and installation of a two piece stairway complete with columns and hand rails, includes, excavation, soil export/import, form and finish concrete stair pad and concrete piers, installation ten pound fire extinguishers, fire suppression clearance for 6,000 sq. ft. (up stairs and down stairs) remove and replace plumbing fixtures in both bathroom units, the installation of soap dispensers and towel rocks, installation of missing electrical face plates, removal of excess debris and obsolete equipment, installation of first aid kits and install fire exist signs, and repairs or replacement of steel metal framed doors, drywall and door frame out, mud, prime and paint. Welding Job was for the installation of 3 rows of 1 1/2" or 1.5 ID tubing at the length of 960 L.F. ZCI has included the use of donated tubing stock piled from BHP. This 3' section will be weld off with 3 tier tubing to match existing fencing design. This Proposal Price is to include all welding equipment, experienced welding labor (of 20+ years) , regular labor (welders helper), transport if any additional materials (tubing) to complete job. Materials used are recycled 3/8" thick tubing in order to give a competitive price. Project involved the removal and replacement of office roof (included truss repairs and/or replacement), Remove and replace existing wall and replaced damaged electrical/phone lines, inspect and bring to code electrical discrepancies, Foundation footing repair of office unit, drywall/tape/texture to smooth finish, prime paint and remove and replace floor tile. Project Involved the demolition and removal of floor tile and concrete foundation to repair a shared 4" sewer line for the men's and woman's lavatory. Project included demolition, concrete removal, soil remediation and compaction, sewer line repair and replacement, concrete pour and finish and tile installation (while clinic was still in operation). 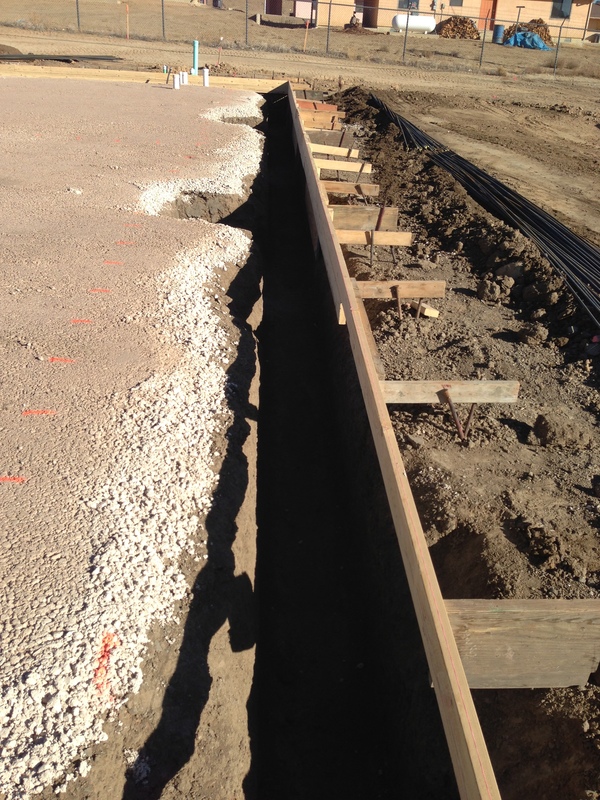 Scope involved the installation of a buried irrigation of 5,600 l.f. pipelines, backfill of trench, & finish grading. Job included excavation for trench, installation of headgates, installation of parshall flume, installation of one preconstruction steel drop inlet structure, installation of 12", 8" & 6" pipe and associated fittings.